Trail Length: Officially it is 8.6 miles but going around some of the snow fields and our route up my fitbit said 13 miles. It took us 8 solid hours to complete. 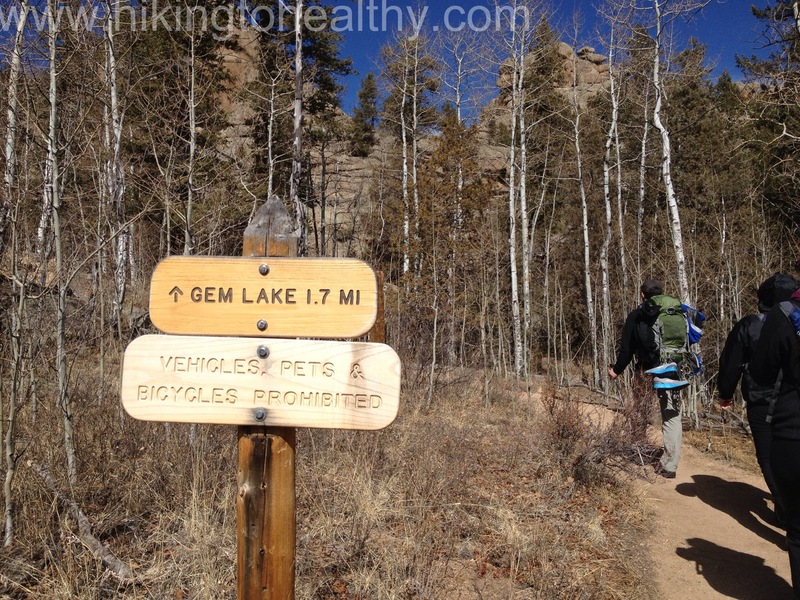 Pets: Dogs are allowed on leash only but note that this does cross over to Rocky Mountain National Park at some places and dogs are NOT allowed there. 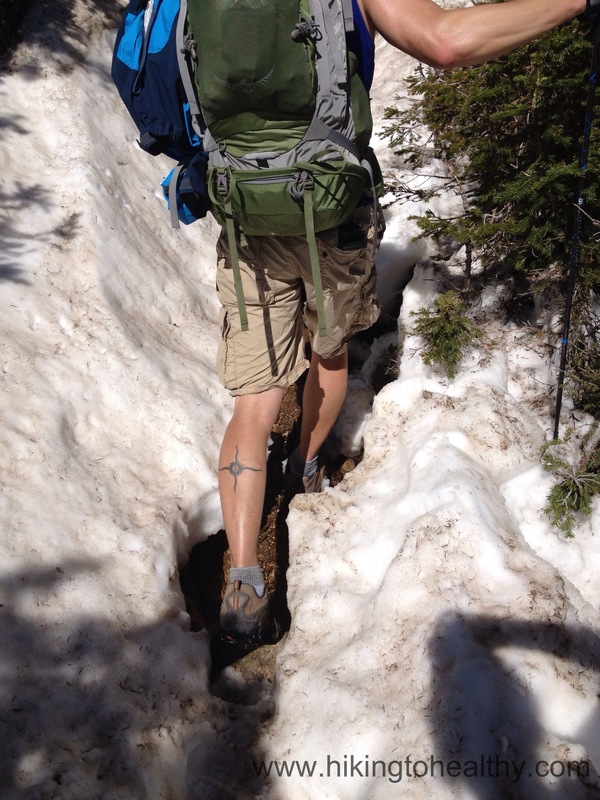 We tried this hike about a month ago and the snow won out. 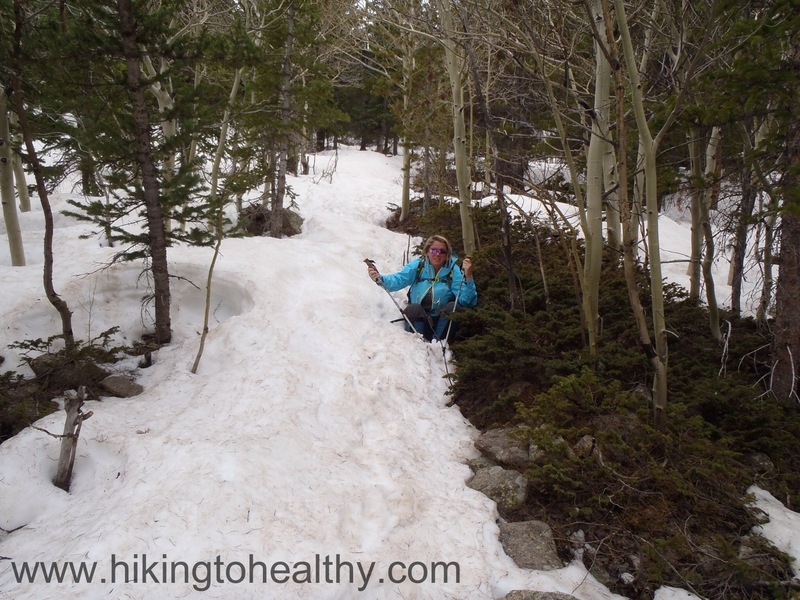 Saturday it was much easier and while snow was still a factor, it didn’t stop us from making it to the summit of St. Vrain Mountain. 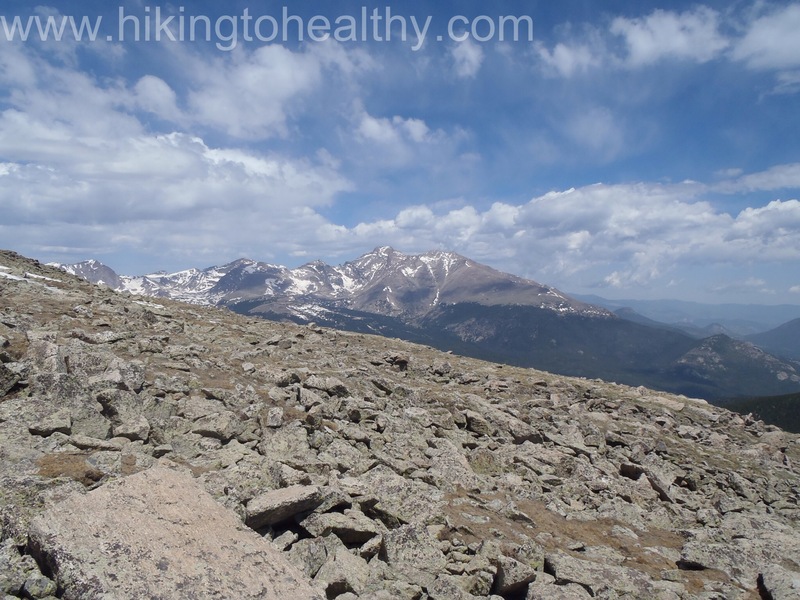 I read about this hike in the Colorado mountain Club Guidebook for the Best Front Range Hikes and when it said 7 hours to do a max of 9.6 miles for both St. Vrain Mt AND Meadow Mountain I figured we should have no problem completing it in less time. Now that I have actually done it, I want to know how someone does this and Meadow mountain in just 7 hours. It was a pretty amazing hike and I picked a crazy amount of pictures so I have decided to do this one in 2 parts, one on the way up and one for the way down as surprisingly they were 2 very different hikes. Let’s talk the start and our way up, we got to the parking lot a little later than we planned around 7:45 and started hiking around 8AM. 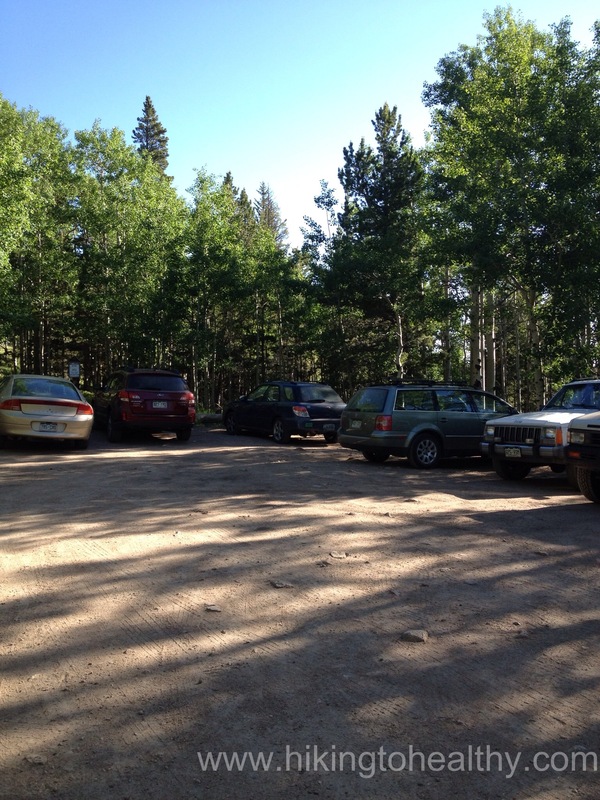 The road from Allens Park to the trailhead does require 4 wheel drive and while there is a parking lot, it is small no more than 8 or 10 vehicles, but you can park on the side of the road leading up to the trailhead. It was almost full when we got there and 2 cars pulled in while we got ready. The trail itself starts off with a nice steady incline nothing too hard to warm you up. There are some rocks through out the path but initially it doesn’t start out too bad and the weather was perfect high 40’s and not a cloud in the sky. 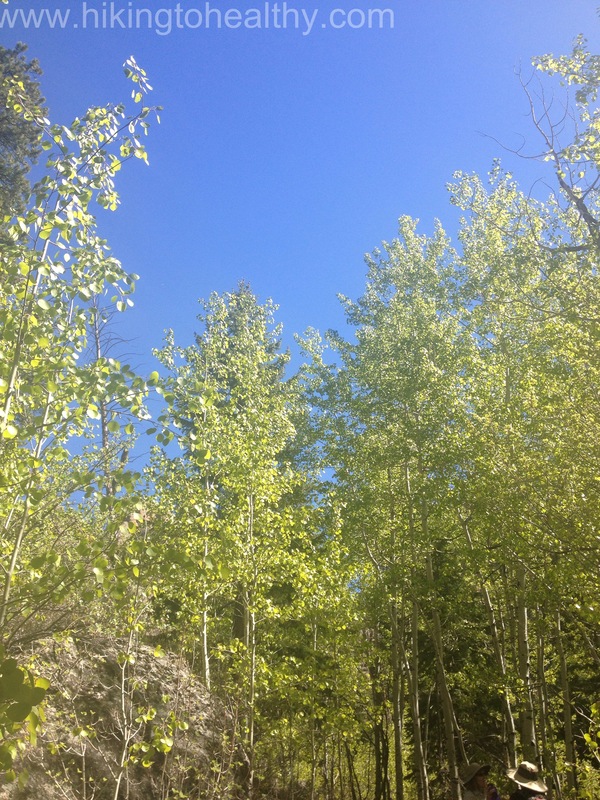 We started peeling off layers pretty quickly, I love that about Colorado 47 feels like 70 and then again so can 90. 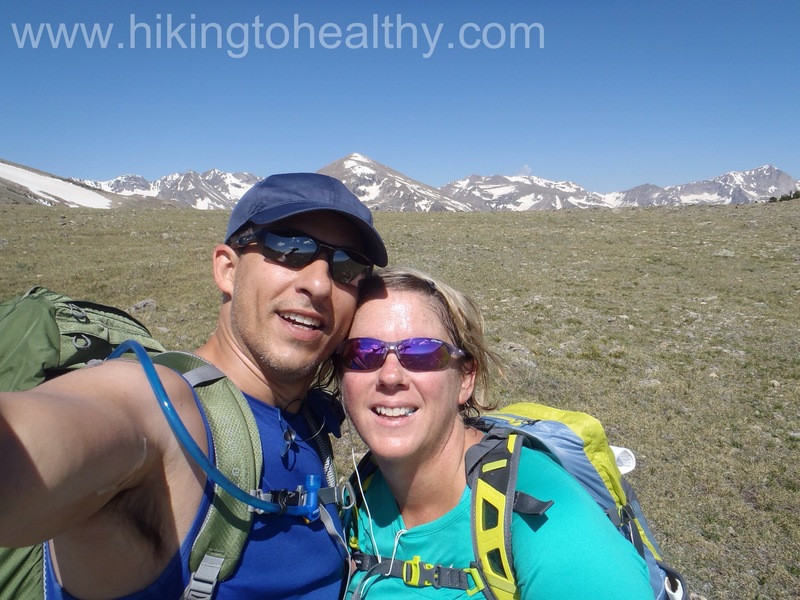 We made it to the Indian Peaks Wilderness sign in a third of the time it took us on our first attempt, which is just under a mile in to the trail. 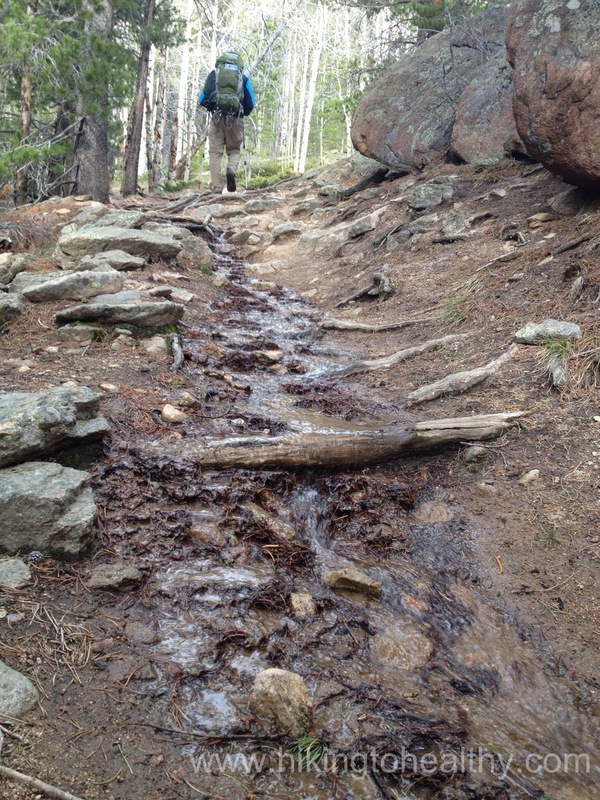 The trail started to get rockier here,while the creek started moving up along the south side of the trail. The nice thing was, no snow in sight and what we learned was that we totally went the wrong way last time. 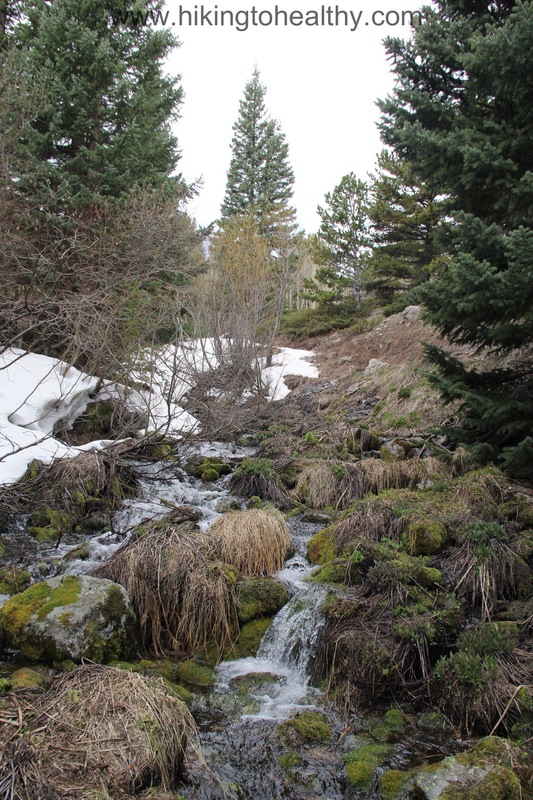 The trail stays pretty close to the creek as it starts to switchback up the mountain and the creek is RUSHING nice and loud from all the snow melt right now. 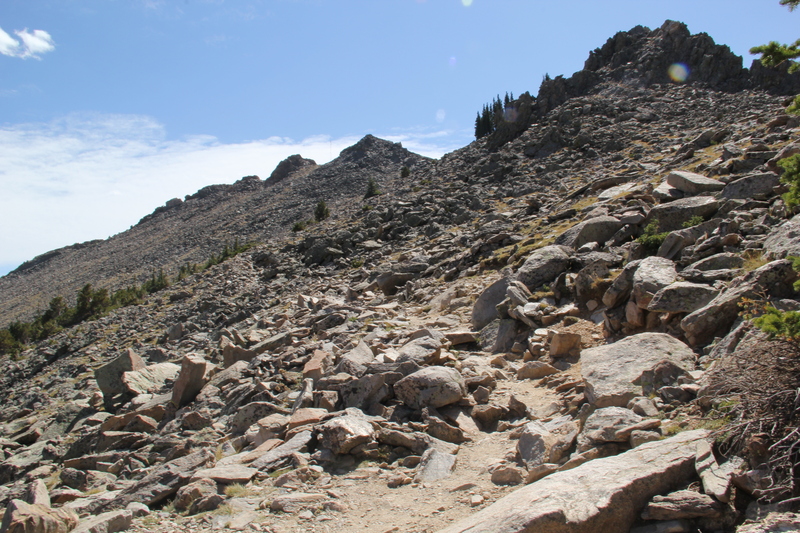 Outside of the actual summit climb, I would say this is the most steep section of the trail. At about 2 miles in the views started to really open up all around and while we had some tree cover we were in the sun about half the time. It was really strong and so we slathered on the sunblock early. 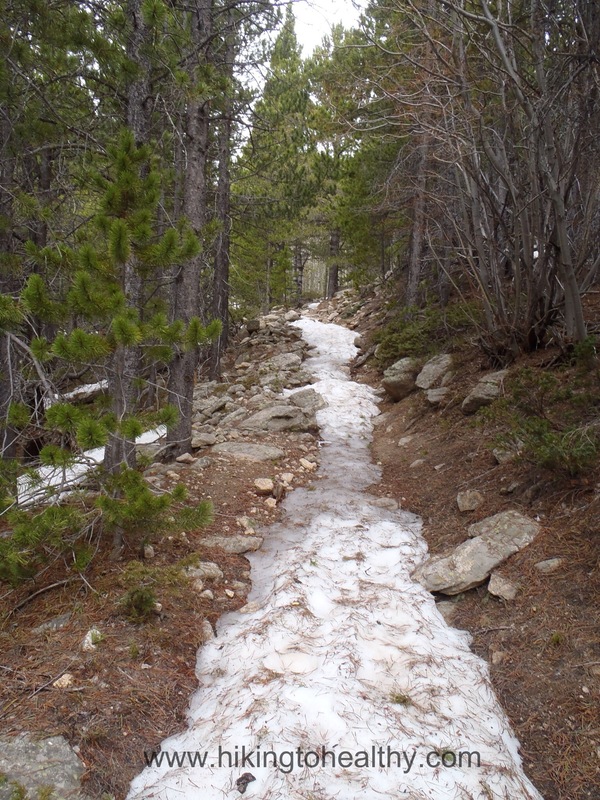 The snow melt was also interesting in that there were little paths of water working their ways towards the larger creek and often are part of the trail itself. 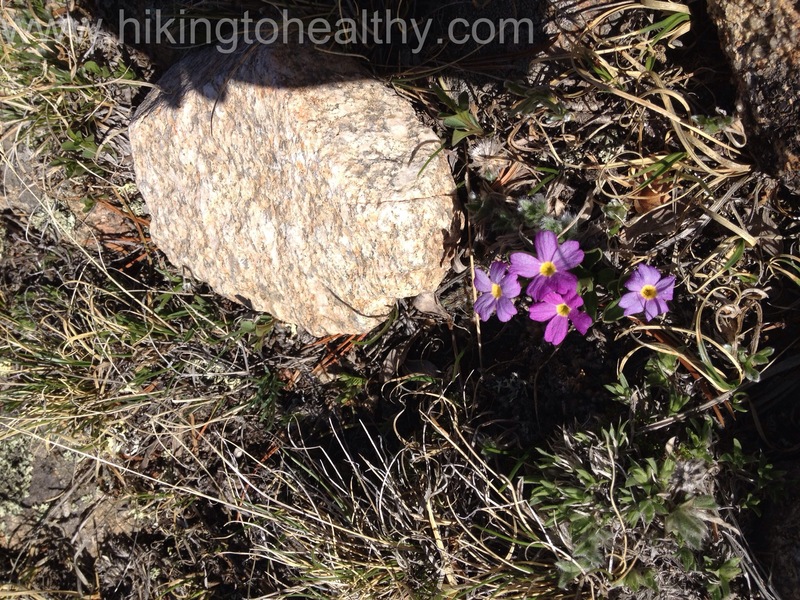 About 2 miles into the trail on a switchback as we caught a glimpse close to our goal. The view at the end of a switchback and the view southeast. We did actually have to cross over the main creek but it was at a good spot and then the switchbacks got very long as we crossed over to other side of the valley here the trees started to spread out. We got to our first snow field at close to 3 miles in and it was interesting as we had to start in a runoff path and then climb up on to the field. From there we followed those who went before us to get back on the trail. It was surprisingly easy but a little nerve-racking as we knew it was deepish snow. We were making decent time all this way, in fact we did this in less time then it took us to go a mile the first time. The snow fields would slow us down a bit and certainly take more energy but overall they weren’t as bad as what we had been dealing with. 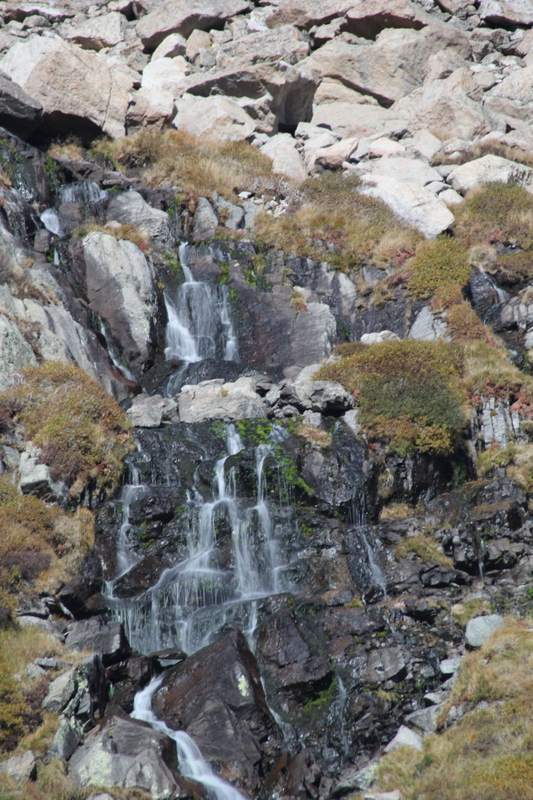 As we started to get closer to the tree line, there were still lots of runoff and I have learned to look behind us often because it is always so beautiful, this time was no disappointment. We also now figured out it was Meadow Mountain on our right. 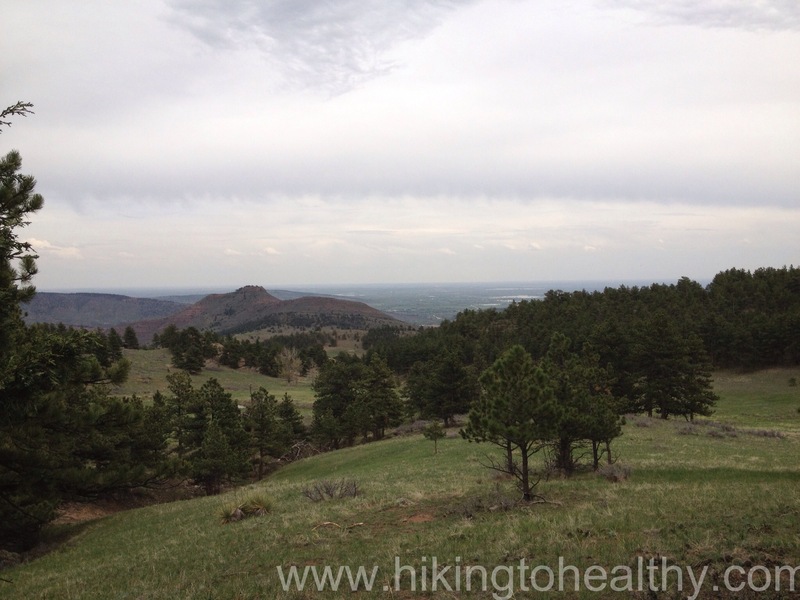 In the trail descriptions I could find it is often suggested to hit Meadow Mountain for an extra .6 miles round trip and an extra 400 foot elevation gain and then go onto to St. Vrain Mountain. 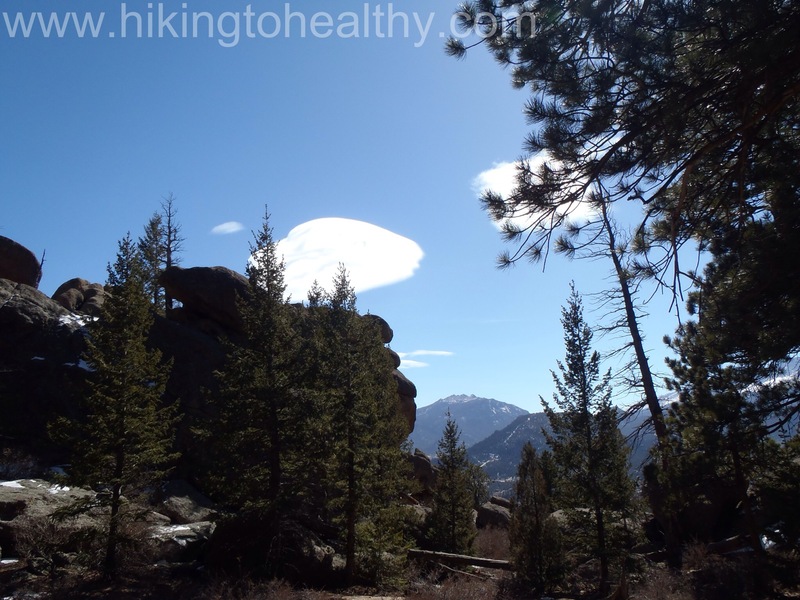 I had decided that if we had time and stamina we would try this addition on the way back but our main goal was St. Vrain Mountain, mostly because I had read there is no defined path up Meadow Mountain that it would require a lot of bouldering. 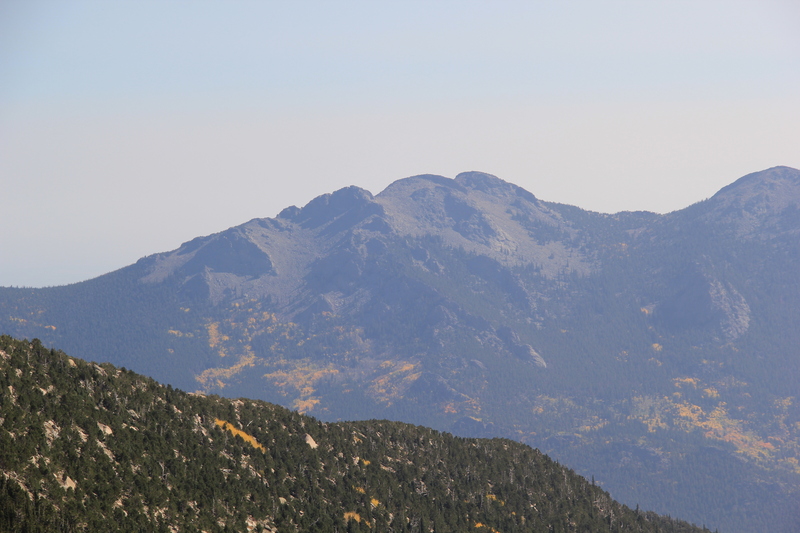 Somehow I missed that St. Vrain mountain was exactly the same only more than twice the height and distance to cover. 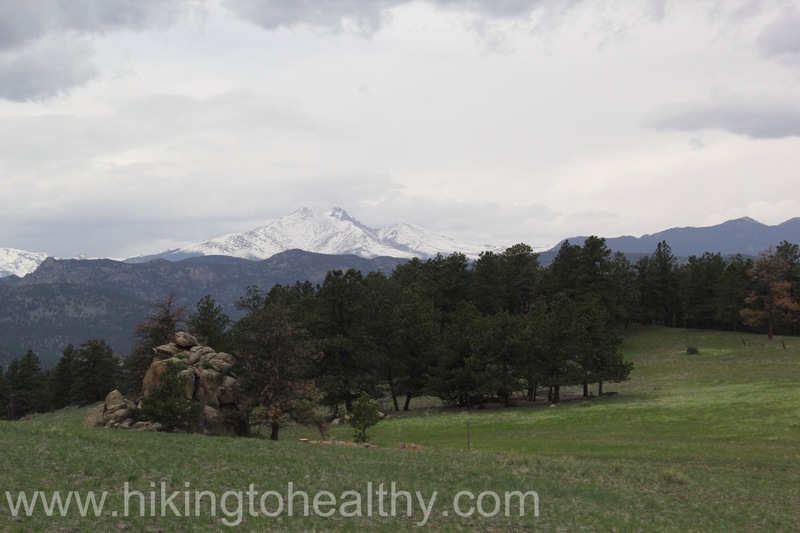 As we passed Meadow Mountain and got to the border of the Rocky Mountain National Park, it was hard not to constantly stare at the amazing beauty of the massive mountains to our right; Longs Peak, Mt. 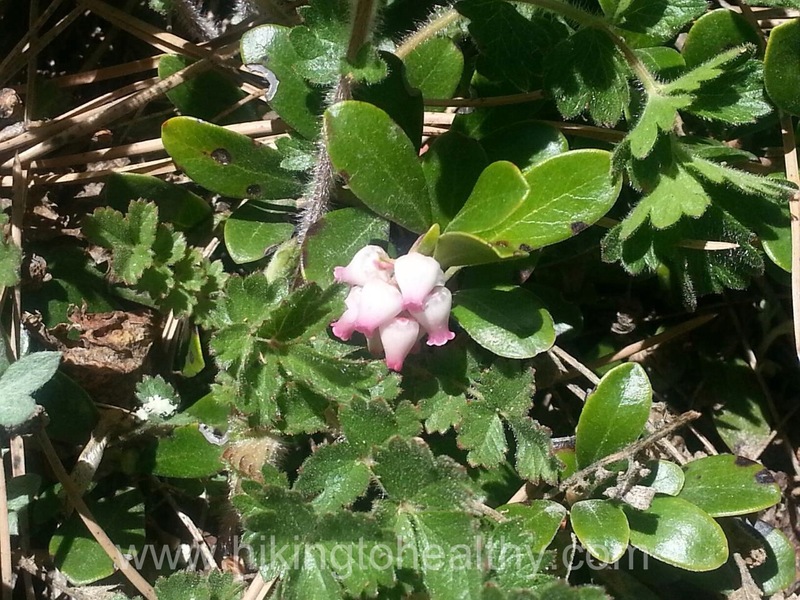 Meeker and Lady Washington as well as the beautiful flowers all along the path, small but plentiful! Us at the border sign very excited about the hike so far. 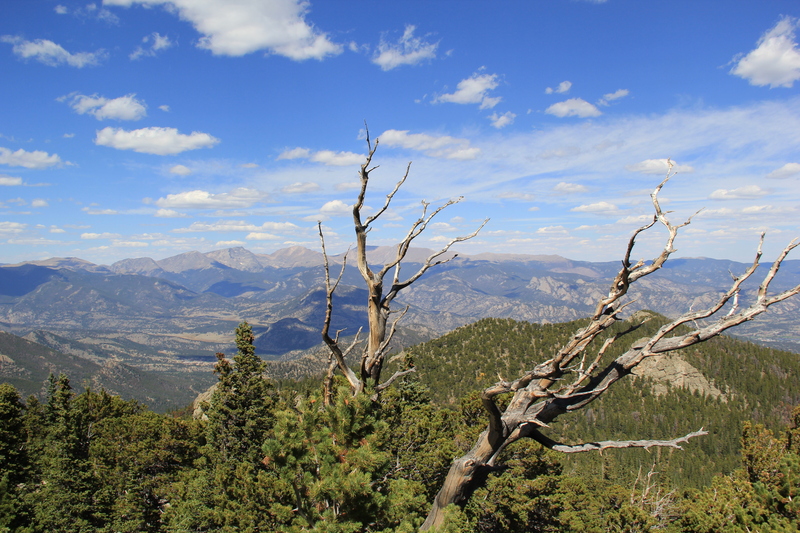 View from higher up on the pass trail. 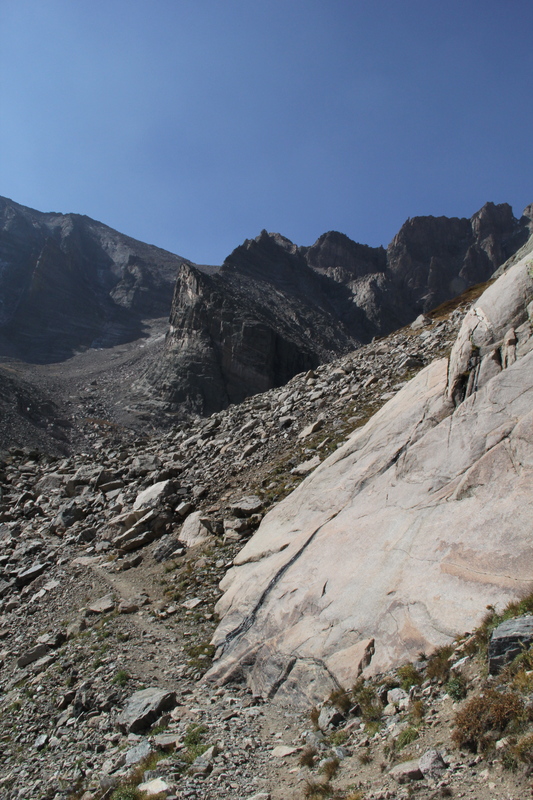 The trail goes from Meadow Mountain over to St. Vrain and at a nice easy incline, when we got to the last the snow field before the final climb the amount of snow and water was amazing. It was not unlike a marsh, Aaron randomly put his pole in a little pool of water only to watch it go down a couple of feet. 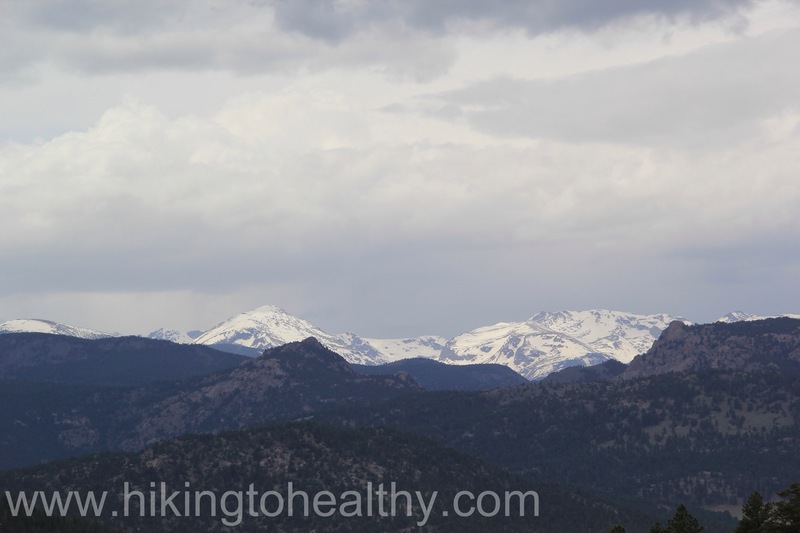 It was a bit of a shock and really struck home how much we have left to learn about hiking in Colorado. 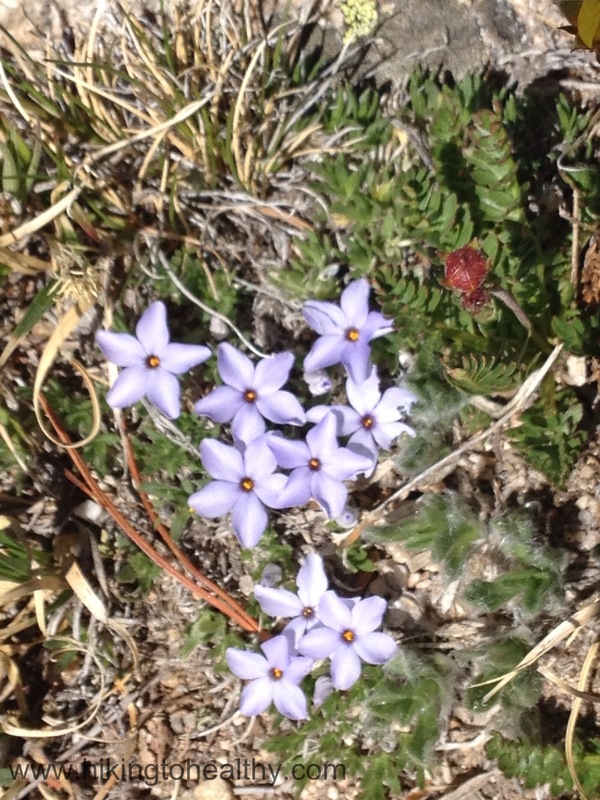 We followed one pair of hikers through the last snowfield to the base of the summit climb. 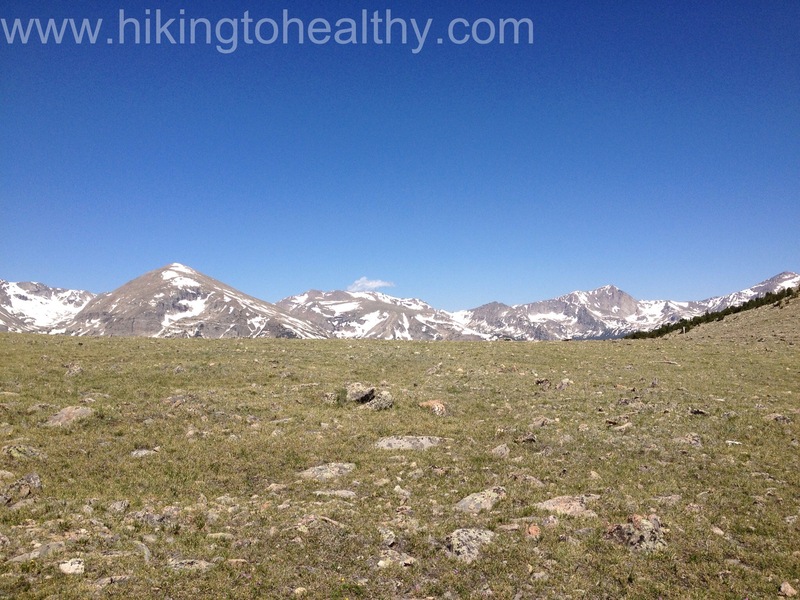 We saw one lone hiker making his own path down and a couple of snowboarders getting in a run down the large snowfield on the East face of St. Vrain Mountain, all going via different routes. 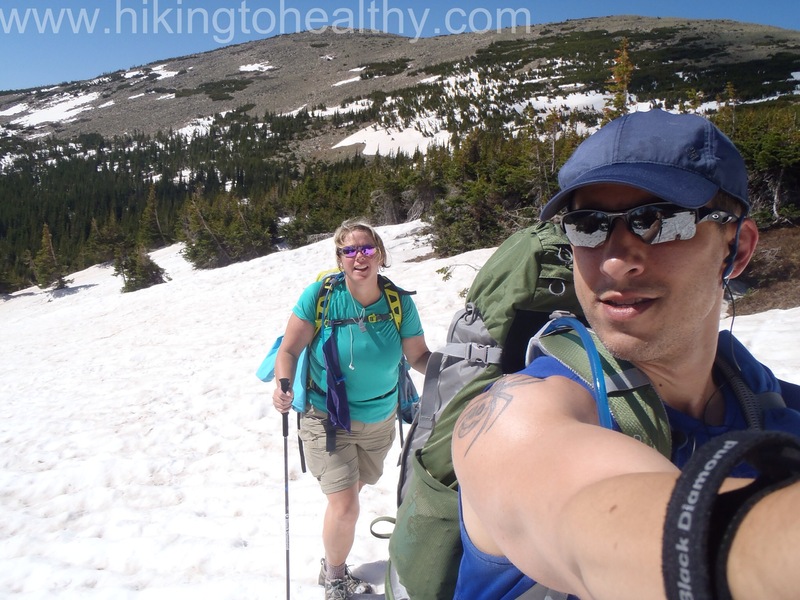 As we approached the end of the snow field, no path was discernible and so Aaron kept the couple a bit head in view and tried to follow where it looked like they might have gone. 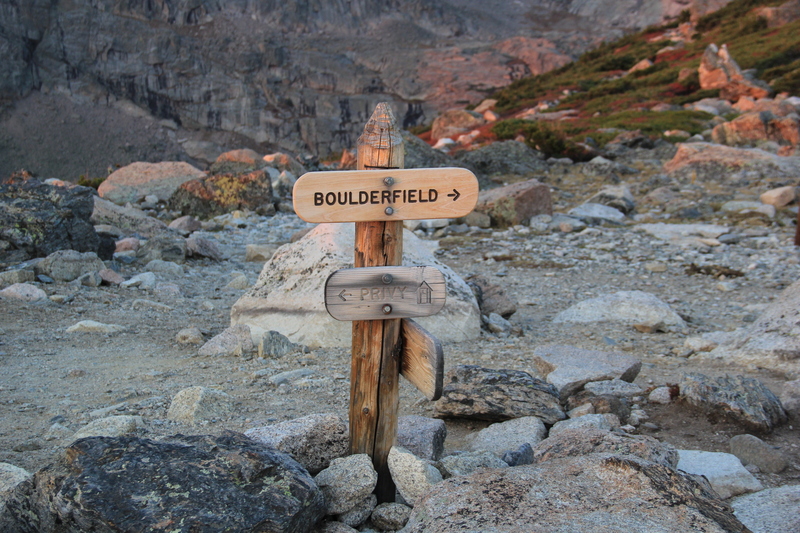 Approaching the Boulder field. It is already pretty steep. 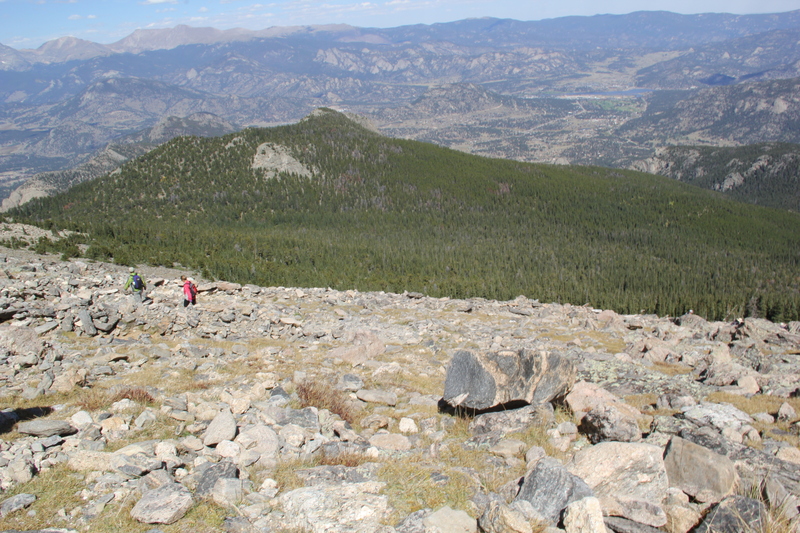 The view north as the boulder field ended and we were steps away from the summit. 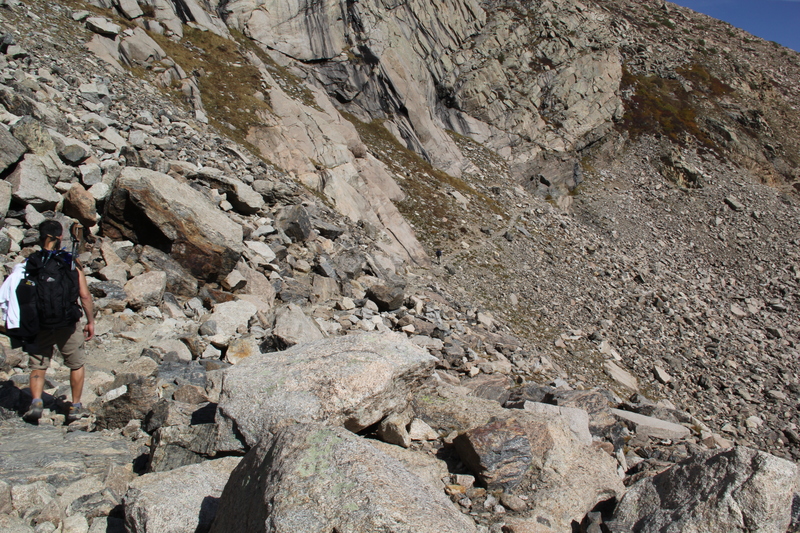 I can tell you I was pretty stressed the entire climb up and repeatedly thought about asking Aaron to turn around, not because the height bothered me but I was using so much strength to crawl over the boulders and for so long with it getting more steep. At some point I realized that I was trying to give up and convince myself I couldn’t do things like this because of my size, but the truth is I was doing just fine. Yes it was hard and yes I was pushing my limits but I was still ok. Interestingly Aaron was doing the same thing for different reasons but because I kept on following him without complaint he kept on going. When we reached the summit I was so crazy proud of us that I didn’t even care how windy it was getting. 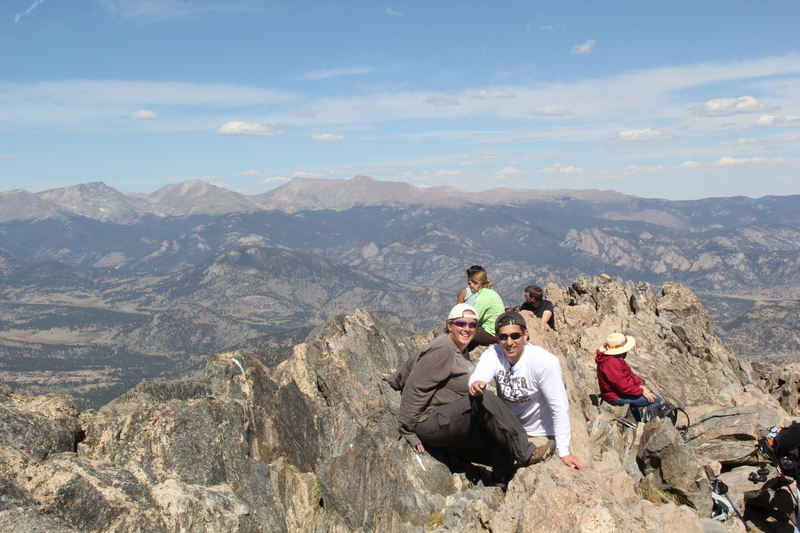 We shared the wind shelter at the top with another couple that was so incredibly nice. It took us 4 and half hours to get to the top and probably at least an hour of it for the summit climb alone. We ate some food, took a bunch of pictures and then headed back down. More to come on the way down, but first the directions and a few favorite pictures from the way up. From Boulder, take Highway 36 north until it dead ends. Turn left at the light towards Lyons and continue through the town of Lyons until you reach another dead-end. 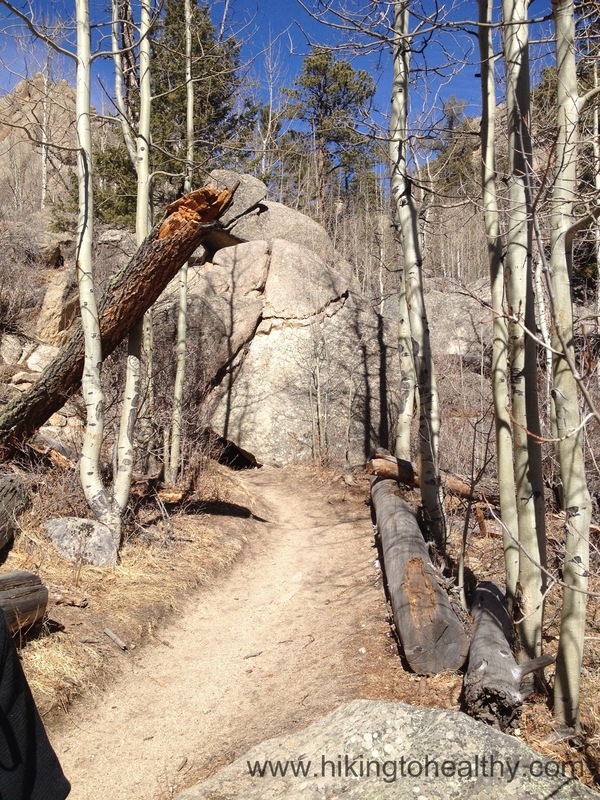 Turn left onto Highway 7 which will take you through St. Vrain Canyon from Lyons to Allenspark. Upon entering Allenspark, take County Road 107 (ski road) south for about 1.5 miles. At this point, National Forest System Road #116 heads up the hill to your right for about .5 miles to the St. Vrain Mountain Trailhead there is a sign noting the trailhead that way. Parking is limited at the trailhead. One of the best parts of moving to Colorado so far has been the amazing friends I have made! These friends have been a great source of motivation, information and comfort for me. Because of them I seen such beautiful parts of the state that I may never have adventured too if not for their advice! 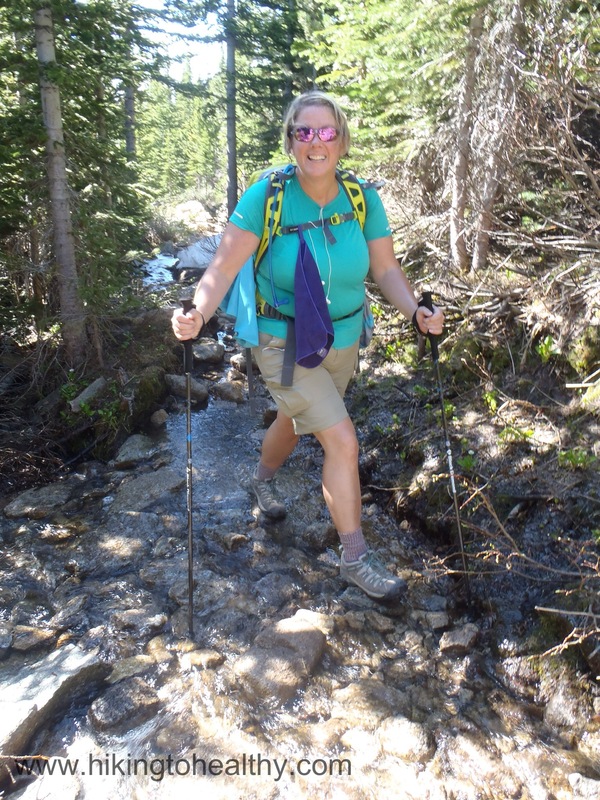 Julie was patient and nice enough to take me on one of my first hikes here, one I later used to help me get in some sort of better shape to try hard harder hikes, Deer Creek Canyon ( hike details here). 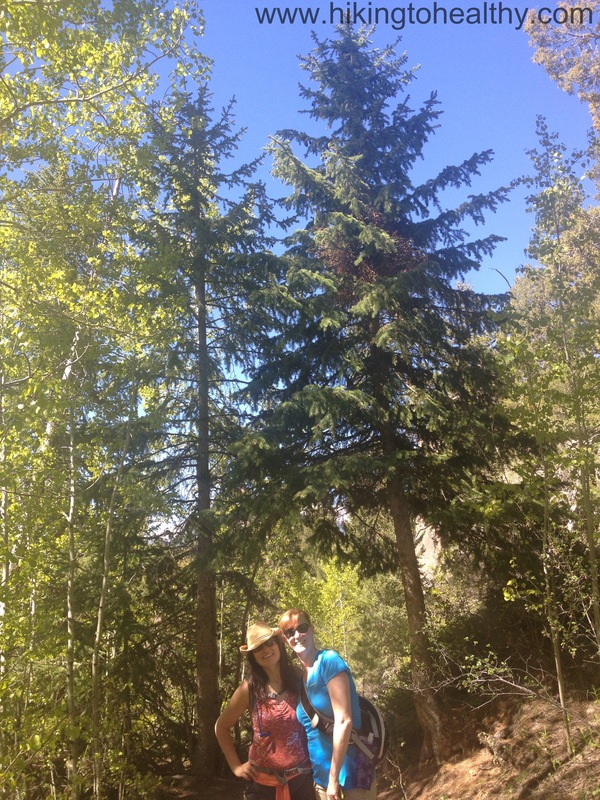 When I think back to that hike with her, I grimace at what she had to put up with from me and with such good grace! 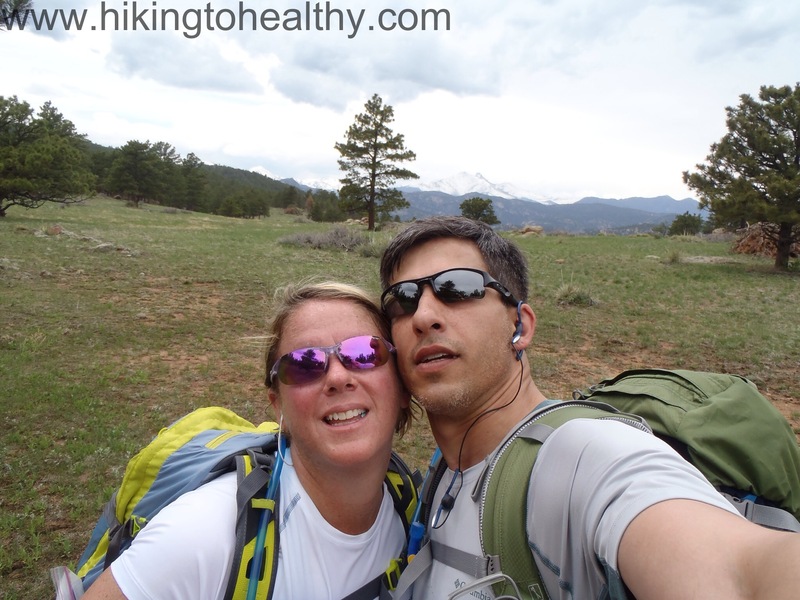 She has been so encouraging in my pursuit of hiking to healthy and everything I pursue for that matter, not to mention just a great friend to bounce hike ideas off of! 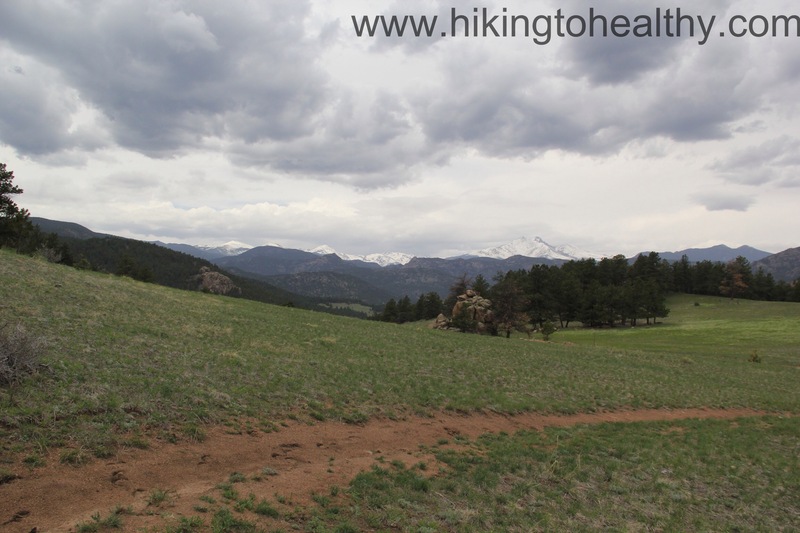 Karin knows so much about Colorado in general it is staggering, she gave me my second go to hike in the beginning of this journey at White Ranch Park( hike details here) with the Rawhide trail. 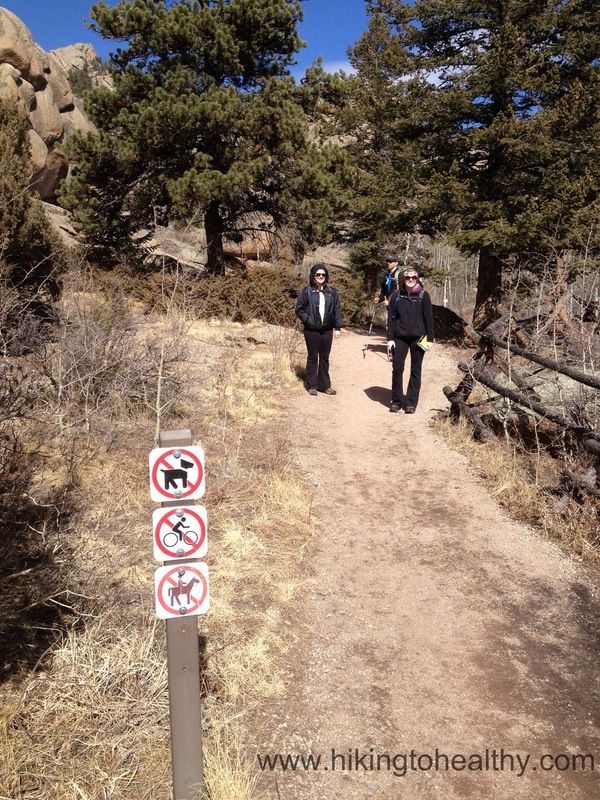 At the time I first started doing it, I thought she considers this easy… note to self never hike with Karin! But as I have learned to discover, people who live here a long time know what is really hard and what is easy. 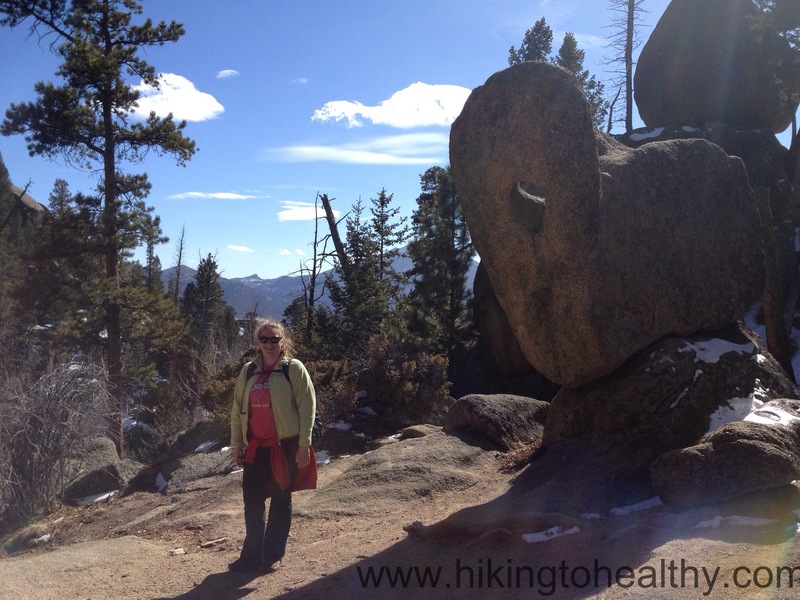 She was right, it is now an easy hike for me but 53+ pounds ago, not so much. She is also my biggest cheerleader every day as I try to live a healthier more active life, she is always bragging on my weight loss to anyone who mentions I look great while she is around. She helps me stay on track when ever I need a little lift to keep on going. Everyone needs a Karin in their life….but you can’t have mine! 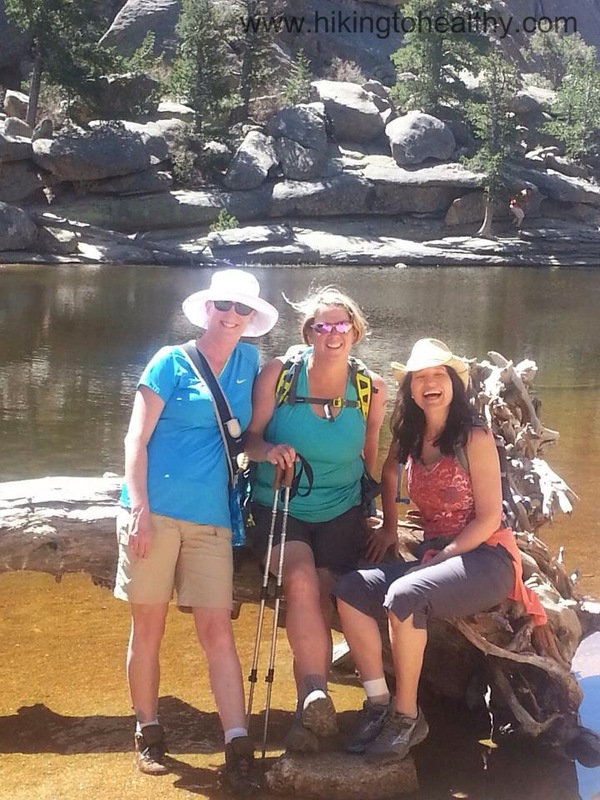 On this particular hike we were missing our third partner in crime, Carrie, who will be joining us for future hikes but she has been equally important to me and our move here. She took me out all over the place to do all sorts of different fun Colorado things, introduced me to so many wonderful people and all while laughing and having a great time! I often remind her that she is the reason I stayed in Colorado and I am thankful every day she helped me through those hard transition times, among other things!! 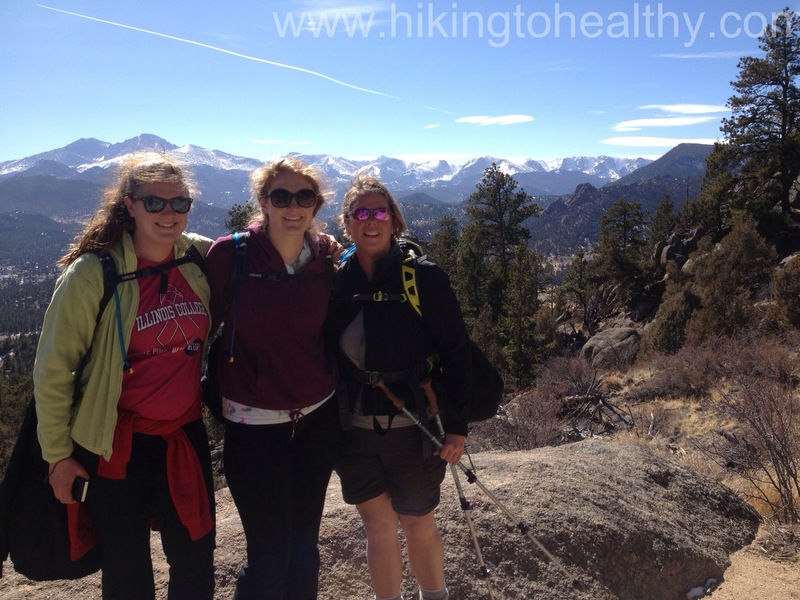 They have all been extra supportive of my hiking and have actually started asking for my advice on which ones to try. 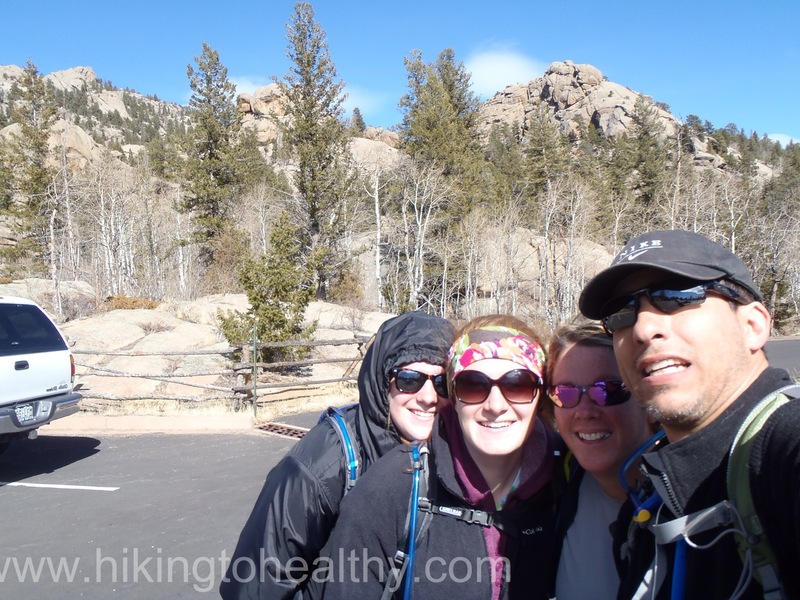 I was so excited that I begged them to come hike with me so this past Sunday I got to show them a trail they have never tried before. 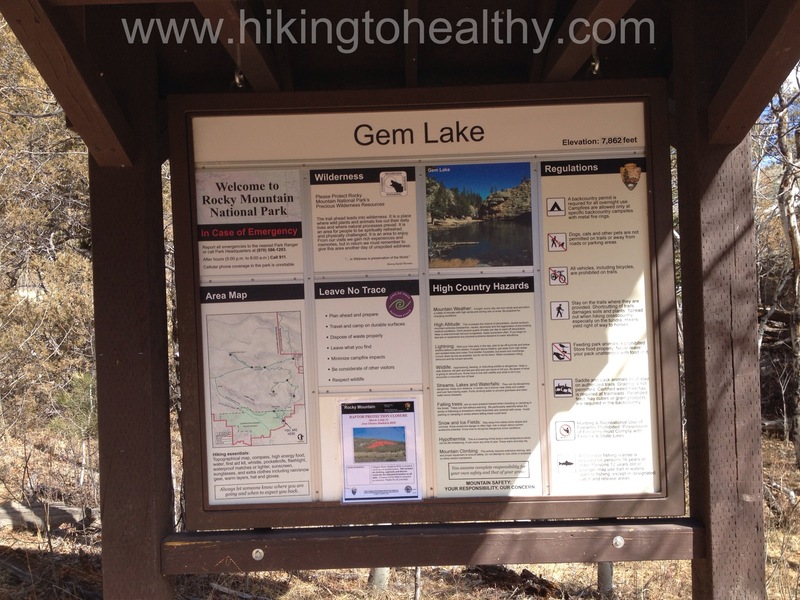 I took Julie & Karin to Gem Lake (hike details here). 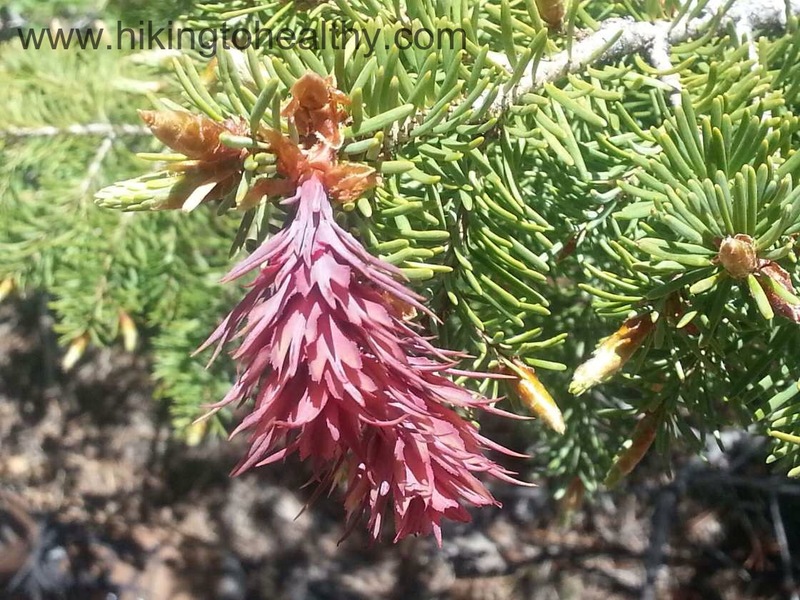 I love this hike because it is the perfect hike to plant the seed of “doing more hikes” with. 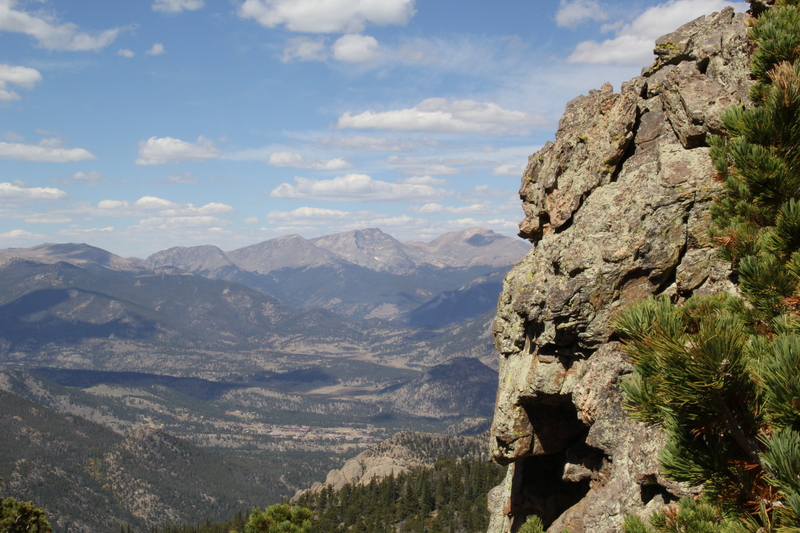 It isn’t too long, has amazing views, and it does have a decent climb so it is hard work but the payoff is so worth it! The day was perfect in terms of weather, close to 70 degrees, sunny and dry which made the sky the best color blue while the clouds were the whitest white! 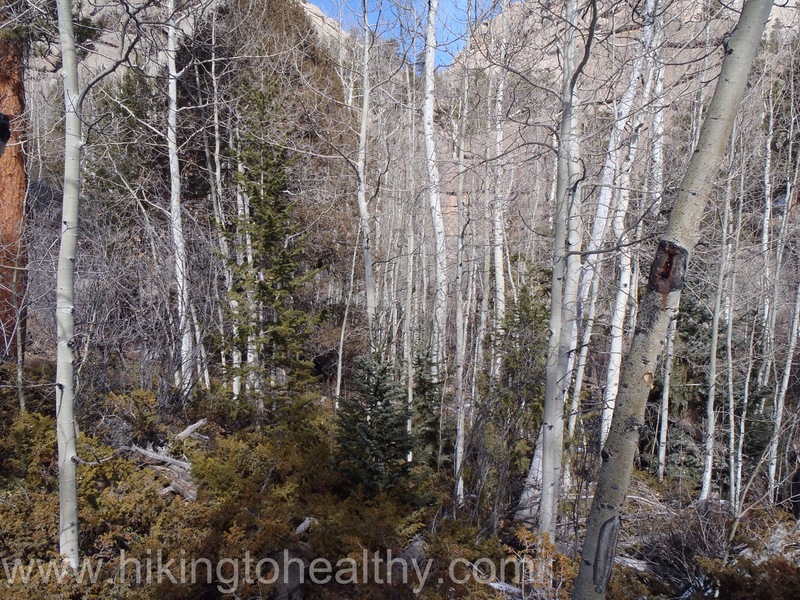 The only down side to the day is that the trail was very crowded, which made pictures a little more challenging and finding a nice spot to grab a snack at the top was harder to come by. 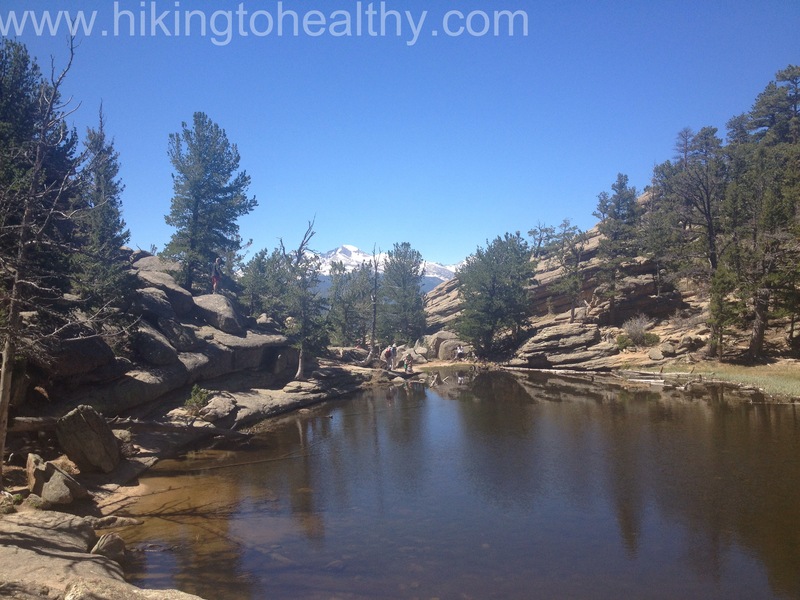 I need to rename this hike as the persuasion hike, because I think it helps in convincing people that Colorado and hiking are awesome! 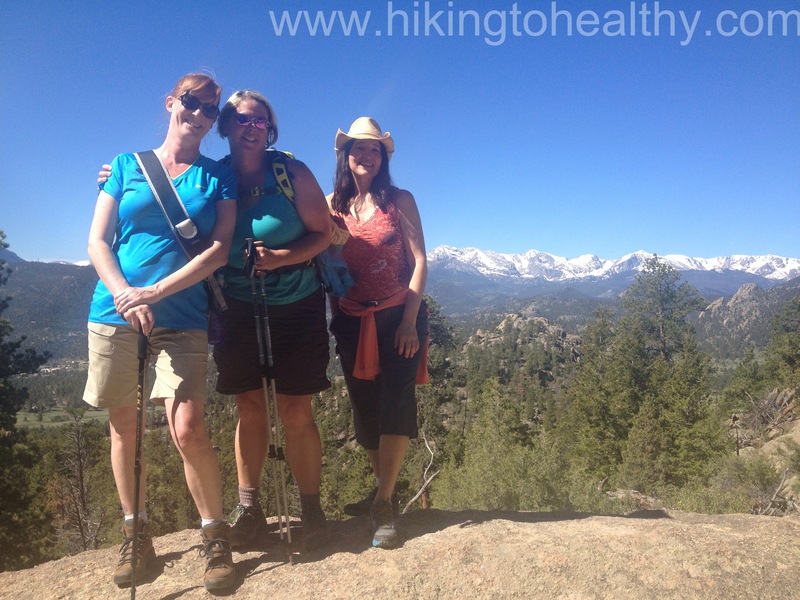 In fact during our hike on Sunday, it was easy to suggest that we try to get together and do a girl’s hike once a month! It was a great day with wonderful Ladies! 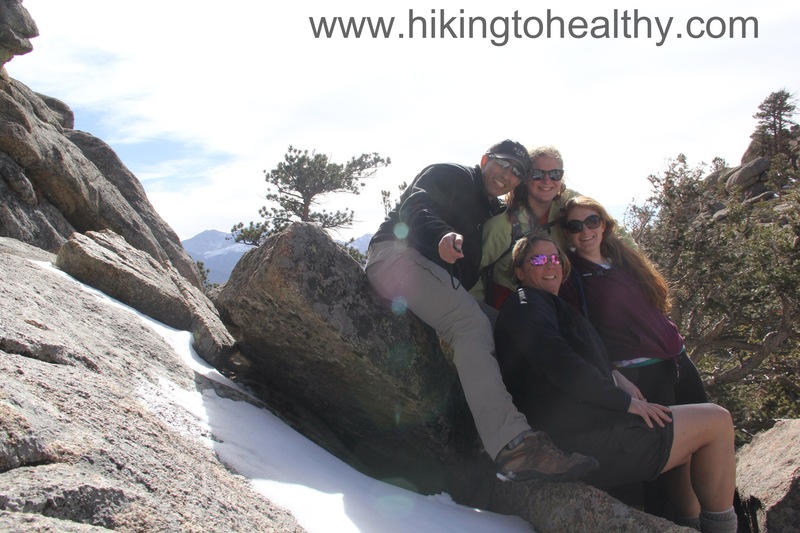 Now once a month I will share with you our friends hike! 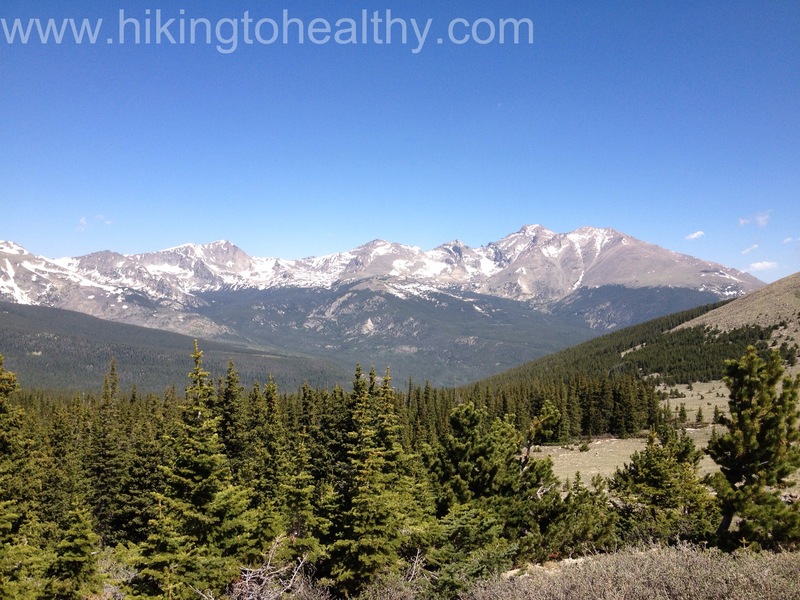 I hope you like the extra hikes! Now for some favorite pictures. Last week was a perfect week here in Denver, very warm and sunny with the mountains taunting us all week with their insane beauty. 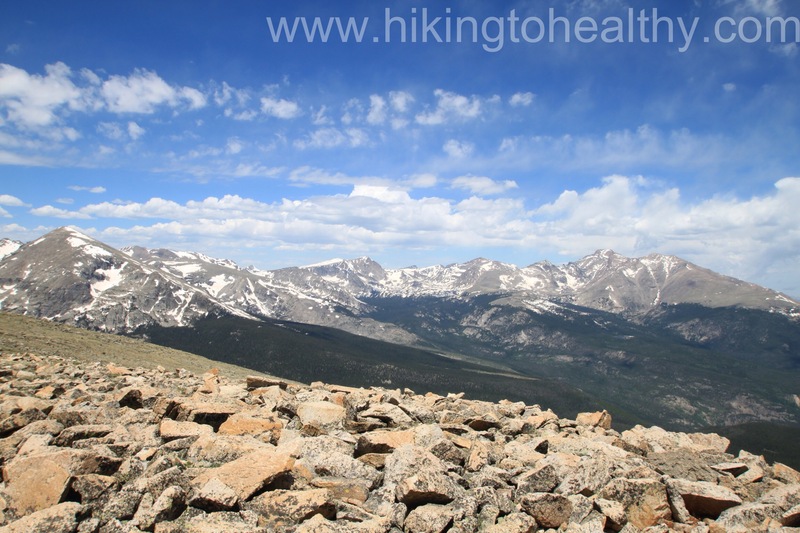 We really wanted to climb up high and see it for ourselves up close, I know it was our naiveté but we made the decision to try another high hike above 10,000 feet and one that was on the edge of Rocky Mountain National Park which got twice as much snow as the Continental Divide. 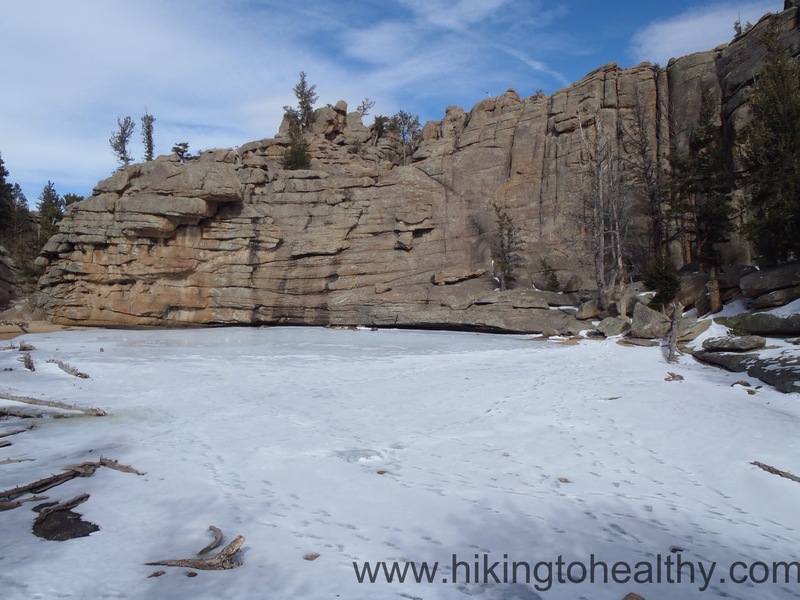 I have been wanting to hike St. Vrain Mountain since last fall and by the time I had the confidence to even think about trying it, winter had settled in. 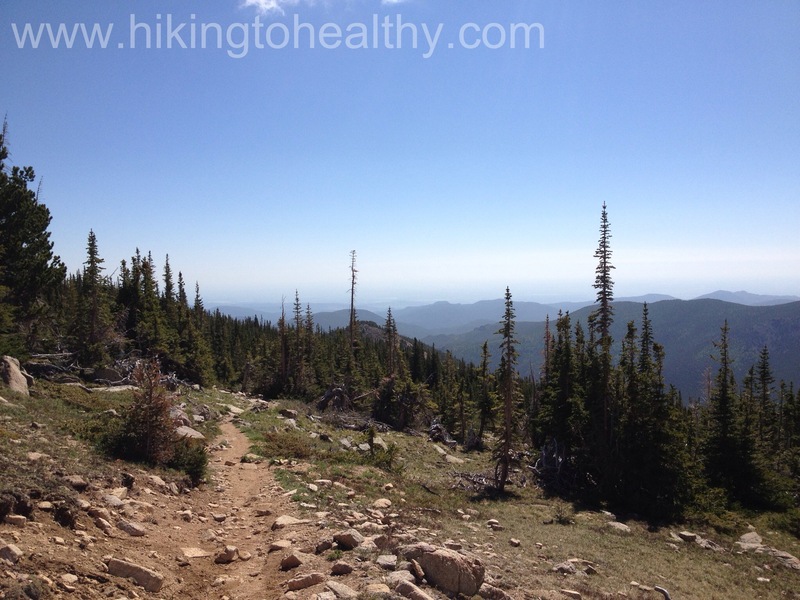 This was the hike we decided to try on Saturday. We talked about it all week and so were extra anxious to get started but nervous we wouldn’t get very far. We were right to be nervous, it took us almost 2 hours to go just 1.2 miles and the last time I post-holed it was pretty bad, up to my hips and it took me like 20 minutes to get out…. What we did see was amazingly beautiful and just got us excited for when we could actually finish it. 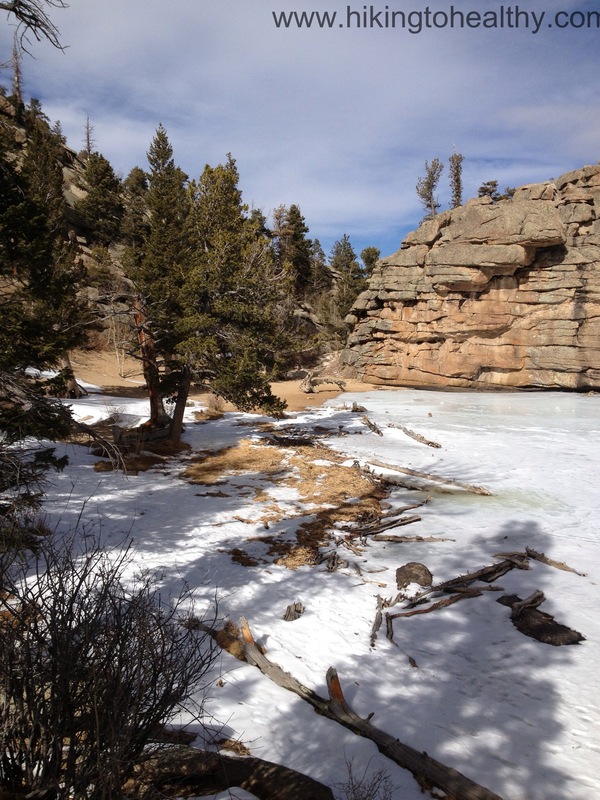 In that 20 minutes of digging me out, we decided that the only way to salvage the day was to get down as quickly as we could and hit Hall Ranch (Hike Details here) which we had passed on the way up to this hike. 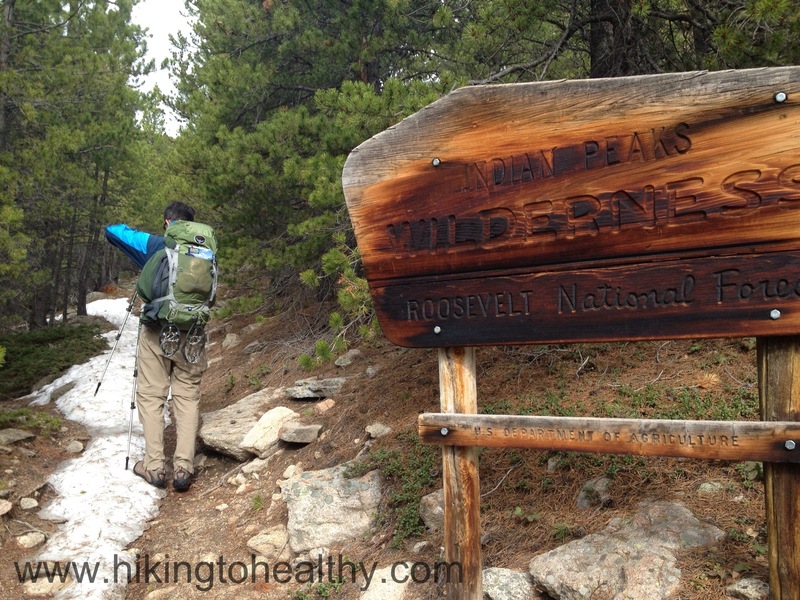 We rushed to the Hall Ranch trailhead deciding to just do as much of the Nighthawk trial as we could and we were kind of excited because the first time we were here it was in the middle of a snow storm so all of our promised views were obscured. We started at noon and finished at 3:30, the trail had a surprisingly low volume of other hikers. Which was nice in that it allowed us to cruise up the trail, I think this is the fastest we have ever hiked. The wild flowers were amazing and the weather was perfect in that is was cool little cloudy but warm enough for us to wear shorts and short-sleeved shirts! 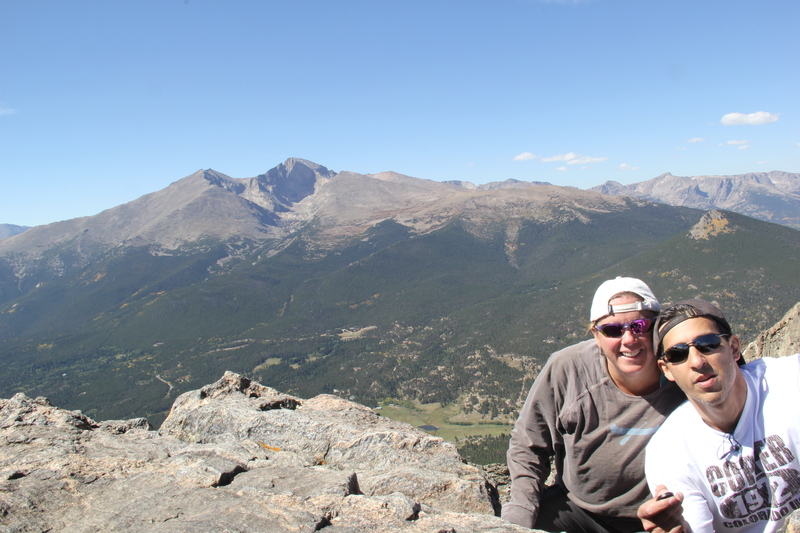 When we got to the top this time the views of Longs Peak, Mt. 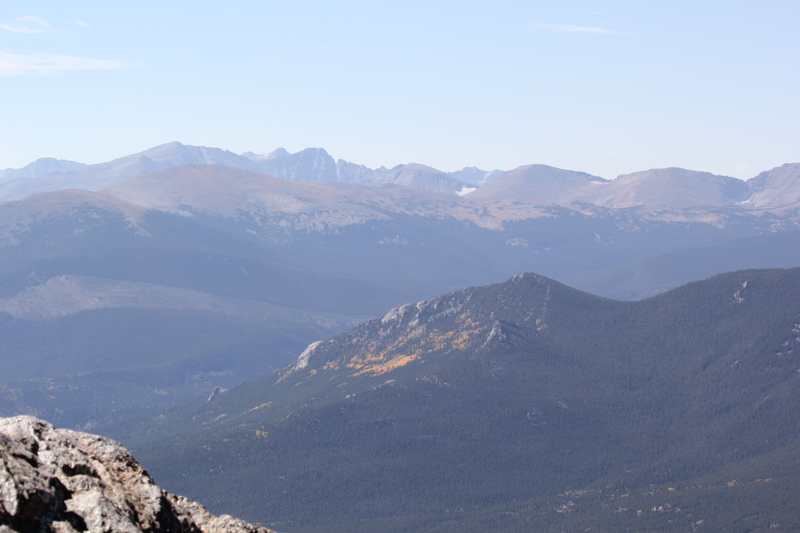 Meeker & Rocky Mountain National Park were really amazing. Actually the views all around were amazing. South, East and North all had different stunning views to offer more than I had hoped for to be honest. In the end we made it exactly to the trail break of NightHawk ( 4.7 miles) and then turned around and headed back. The whole day of hiking gave us a total hiking of 12 miles with 2300 total feet of elevation gain it was sadly 7 hours of hiking with a 30 minute gap to drive from one trail head to the other. At first it was a little disappointing to have to turnaround on the first trail, but if I think about where I was 2 years ago or even last year, I never would have made it through one of these trails let alone stopping one after 3.5 hours only to do another one for 3.5 hours. It felt pretty awesome! We decided it was a pretty huge win and so celebrated with lunch/dinner at Oskar Blues Grill & Brew. 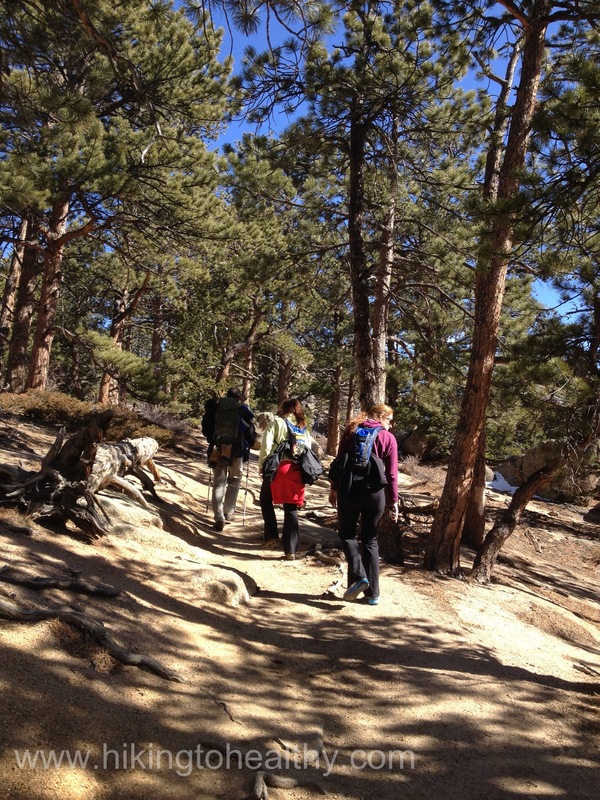 Here are some of our favorite pictures from the hike! 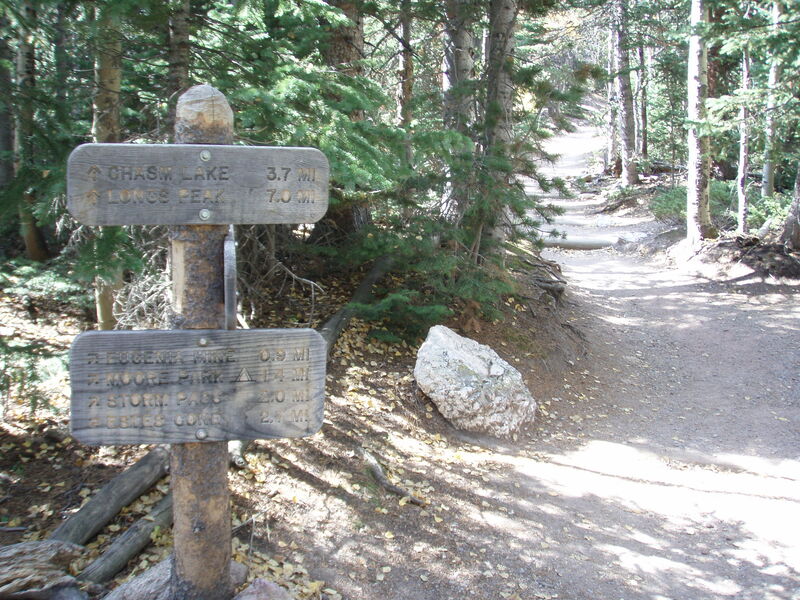 Trail Length: According to the map it is 1.8 miles one way to the lake for a total of 3.6. We did a lot of walking around taking pictures so in the end we had a little over 4 miles on my fitbit. It took about 2 and half hours for our whole trip. 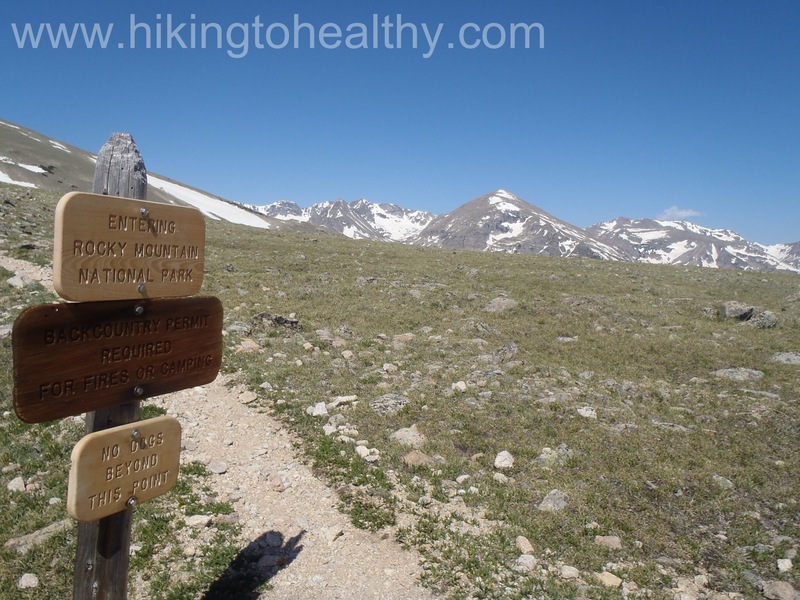 Degree of Difficulty: This one is hard for me to categorize, I would say overall Moderate but the elevation gain is a lot in a short distance and so some parts could be considered strenuous…. 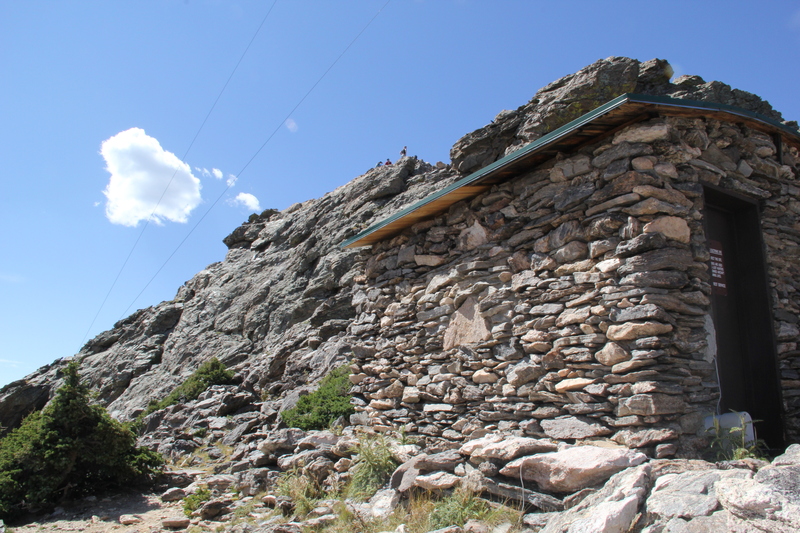 Bathrooms: Yes, at the parking lot/trailhead and then there is a privy not too far below the lake itself. 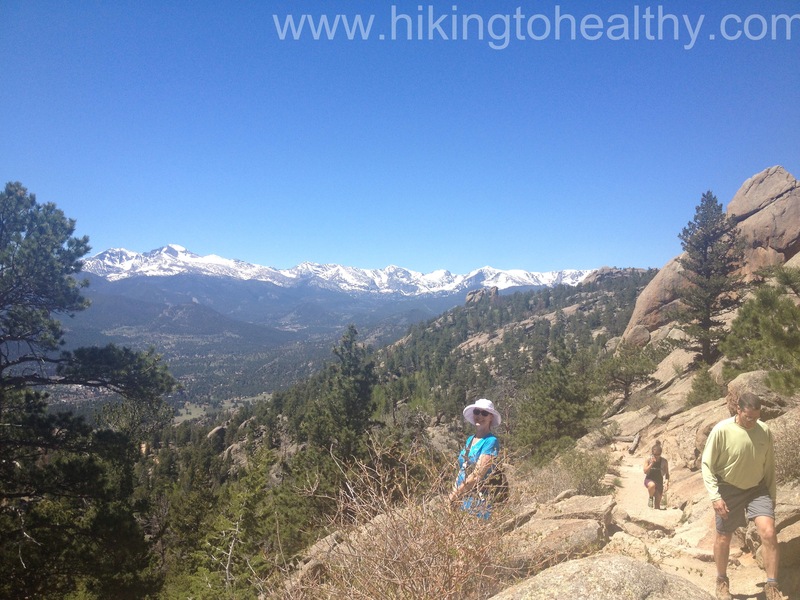 When I was looking at different hikes for when Lauren and Anne were here, I wanted something with great views. 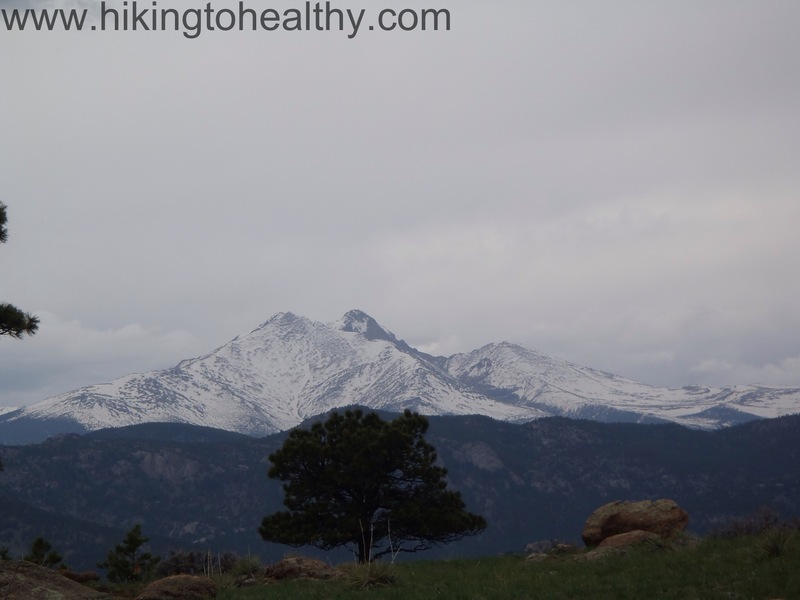 Normally I would have taken them to a hike I had done before but at this particular time of year all those great view hikes were probably under quite a bit of snow. 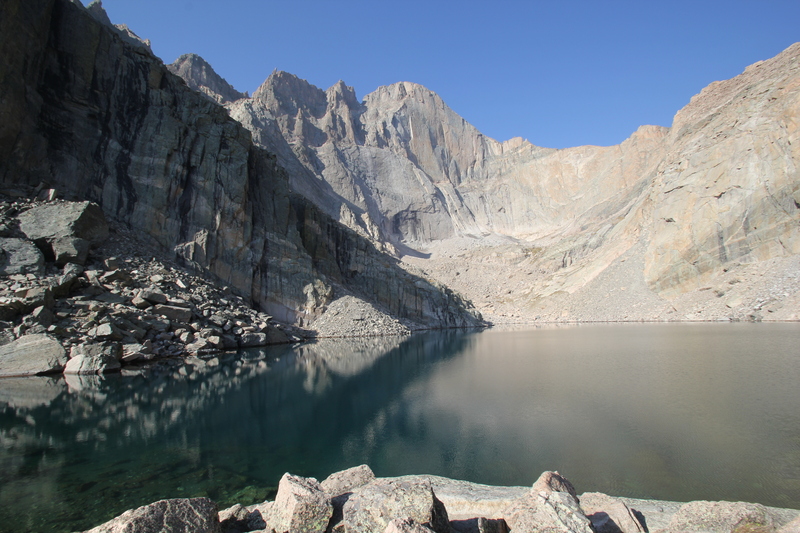 I liked what I read about Gem Lake for different reasons, it was not too long with spectacular views of Long’s peak, Mt. 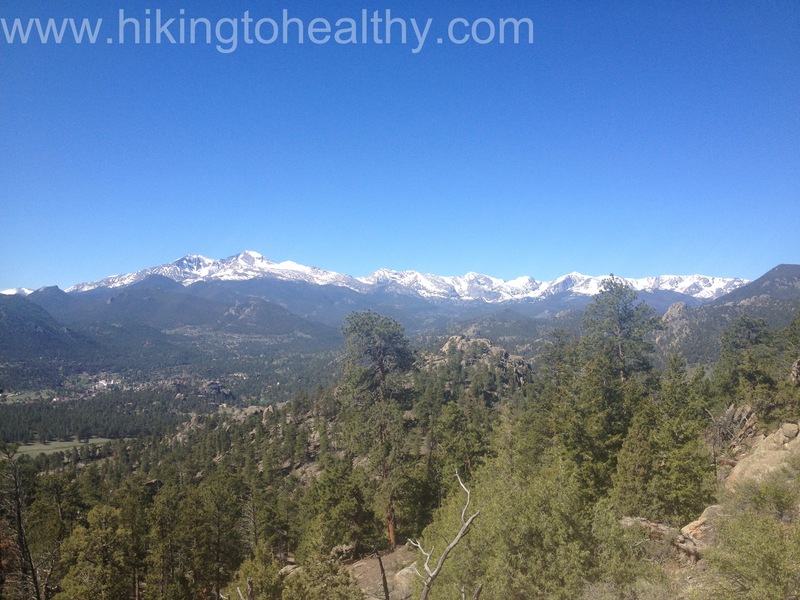 Meeker, the Twin Sisters and the whole town of Estes Park down below along with a nice elevation gain. The other bonus was that we had tickets for the ghost hunt tour at the Stanley Hotel later that night so it gave us lots to do in Estes Park. 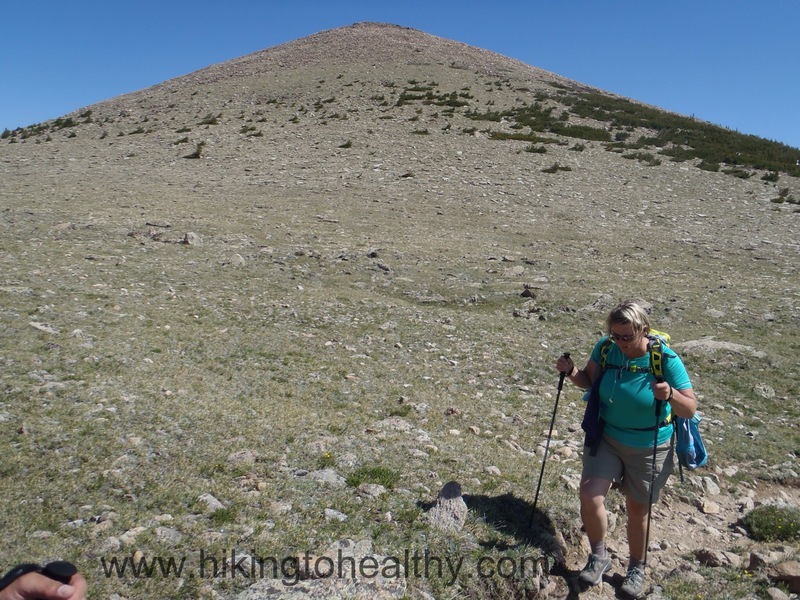 I have also been wanting to do this hike for a long time but since we have been focused in getting more stamina a hike under 4 miles kept getting knocked off for longer, harder hikes. 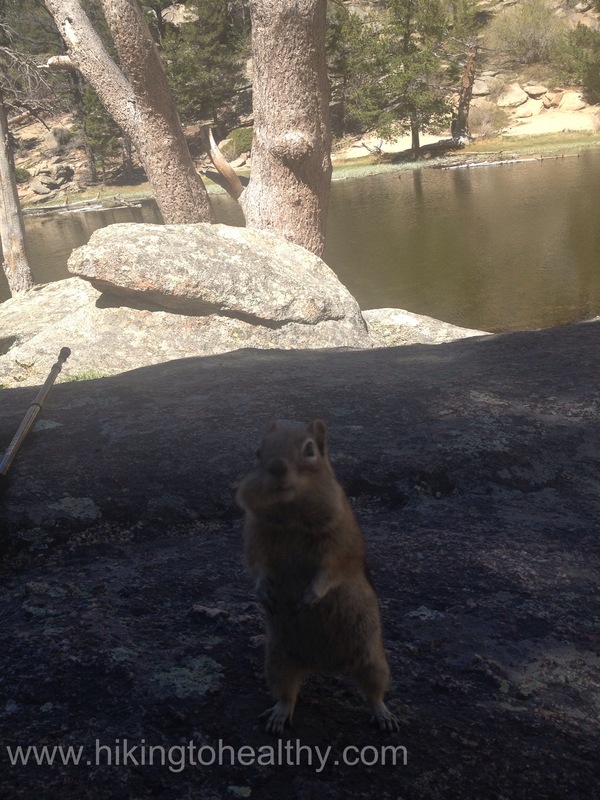 My final reason, evil genius plan to make my nieces fall in love with Colorado…. Lets talk trail, this is a short trail that climbs quickly but has some very well placed straights to catch your breath on with stunning views to admire. From the parking lot you want to go to the vault toilet and take the path to the right of it, this is the Gem Lake trail it is very easy to follow and is straight in and straight out. At points there were some stairs to help with the climbing but the path itself is pretty easy. It actually runs through and along Lumpy Ridge and the rock formations were really neat. 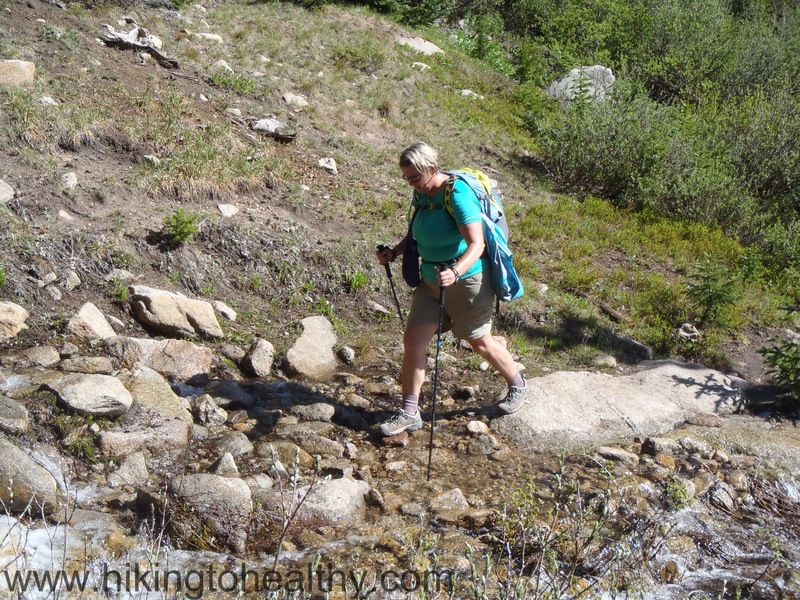 The best part is that the trail is done in such away that you are always moving towards the next great view and the trail is so easy to follow. 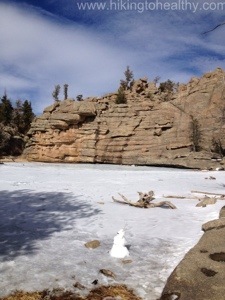 We were lucky to have a pretty nice day, we started out a little chilly but quickly stripped off layers as we went up. After this is a great Aspen Grove that my nieces thought looked like it should be in a museum as a perfect depiction of an alpine aspen grove and I had to agree. From here it is not far to the lake and the last climb. The steps could get challenging as there was some with long distances from one step to the next so I think this is where other hikers have decided to classify this as a harder hike but if you take your time getting through it is no problem. Also there is a privy up here. 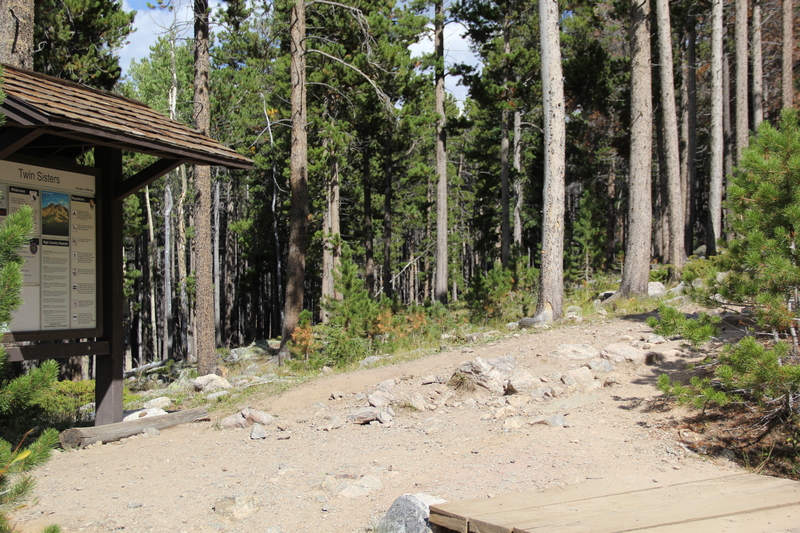 Privy’s are so interesting and I encountered one when we hiked Chasm Lake I just want to giggle every time I have to use one because there is barely enough coverage to get your business done. 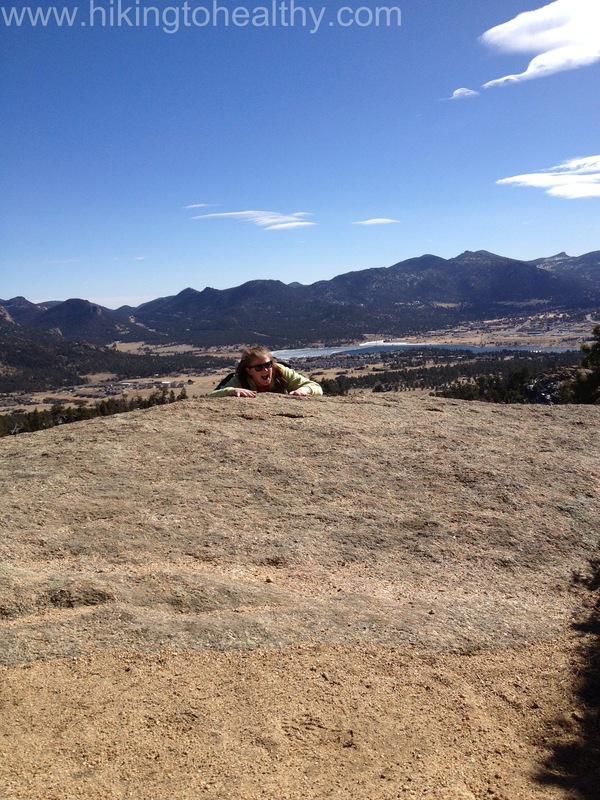 At least this one was kinda down and behind a huge boulder so you could sort of get off the trail and out of view. 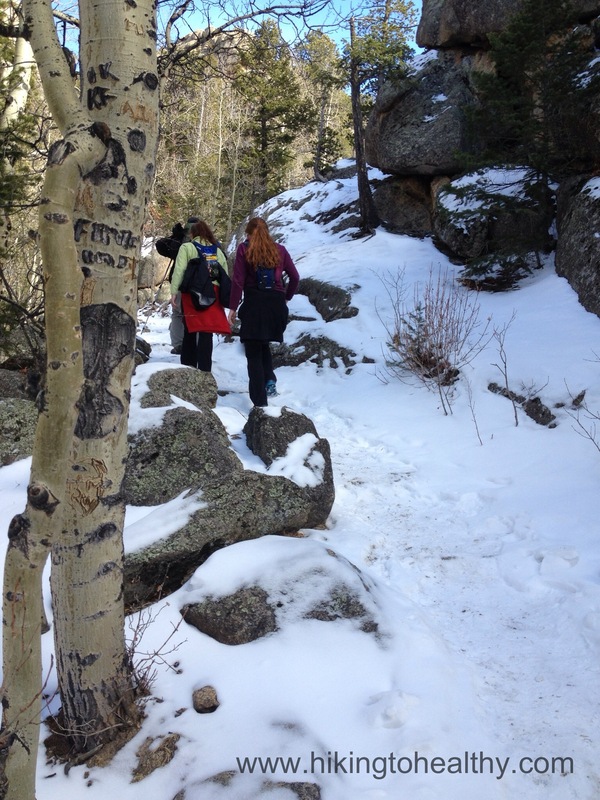 The last stretch of trail was a little in the shade and so snowy but not hard to get up or down at all. From here it is an easy scramble to the lake, which was frozen when we got there but still beautiful and the views around were amazing. We took a bunch of pictures, pretended to be yeti’s waiting to be spotted laughed a ridiculous amount and then headed back down. 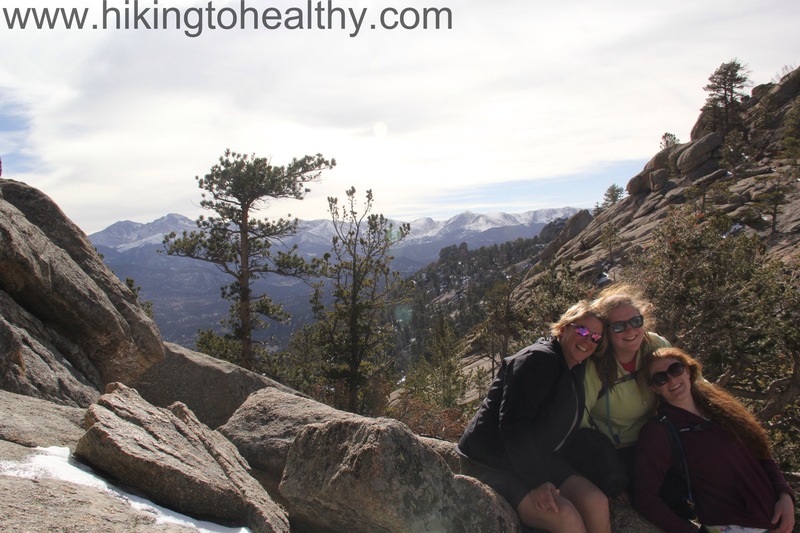 I have to admit hiking with my nieces was so much fun, today’s hike ( post coming) was a little subdued because we didn’t have their company! 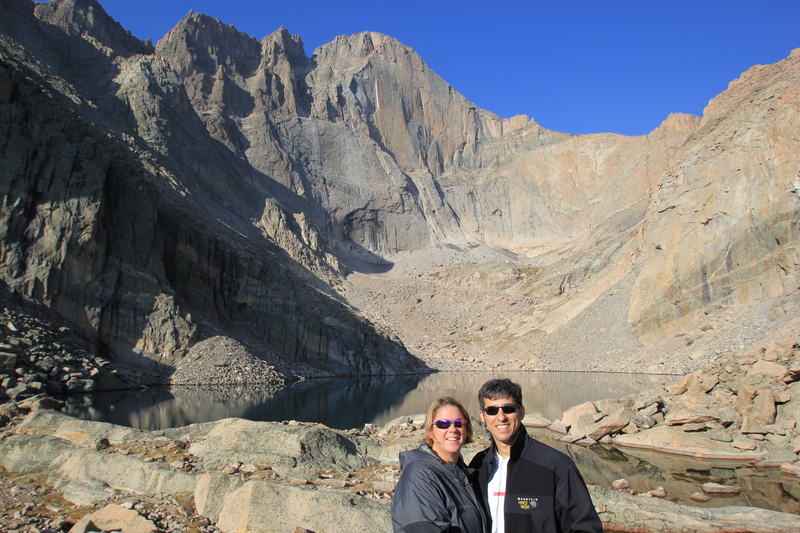 We are already counting down the days until their next visit so we can show them more of beautiful Colorado. After the directions on how to get to the trail I will put some of our favorite pictures. This trailhead was relocated to the northwest of the old trailhead, and the parking lot expanded. 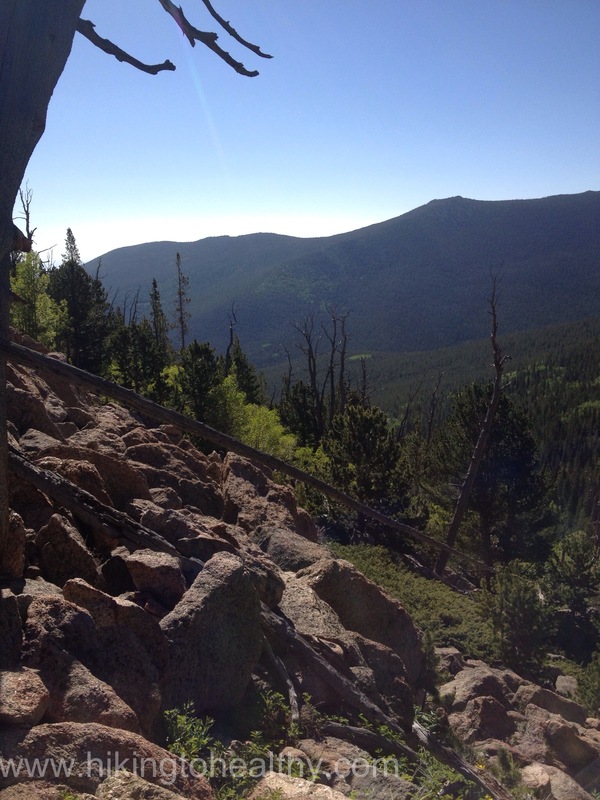 The turn-off to the new trailhead is approximately 1/4 mile west of the old Gem Lake Trailhead, on Lumpy Ridge Rd. 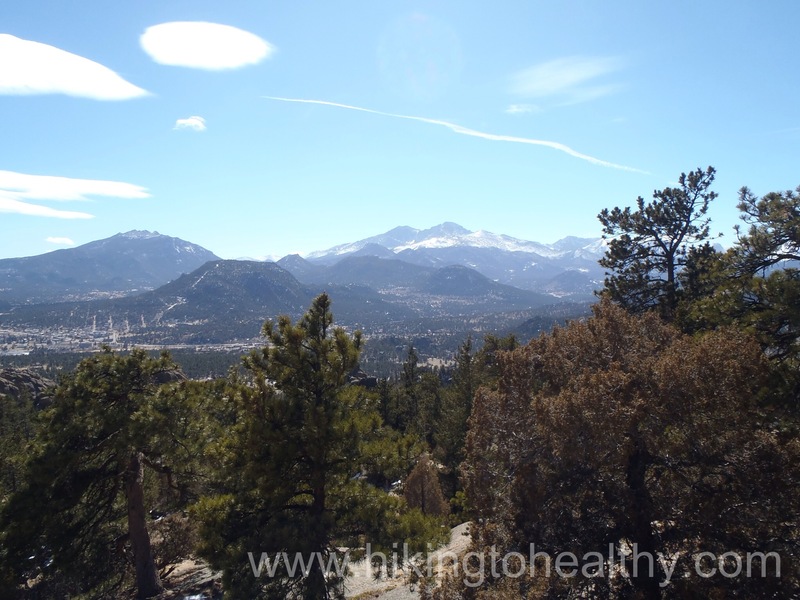 From Estes Park, take the US Hwy 34 bypass (the road that goes by the Stanley Hotel). Just west of the Stanley, turn right (north) onto MacGregor Avenue (CR 43). The road makes a hard right at the entrance to MacGregor Ranch, after which it is known as the Devils Gulch Rd. Veer right, and proceed about 3/4 miles to Lumpy Ridge Rd. Turn left onto Lumpy Ridge Rd. The Lumpy Ridge Trailhead and parking area at the end of the road. Trail Length: 8.6 Officially (unfortunately we made the mistake of passing the Chasm Lake trail by almost a mile so my fitbit said 12 miles) We spent probably 6-7 hours total actually walking. 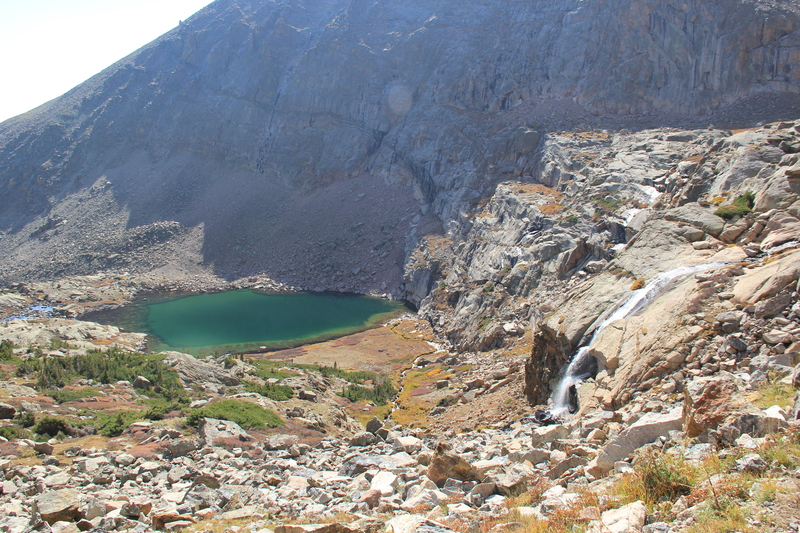 Bathrooms: At the parking lot, and at 3.8 miles at the trail junction and at the base of the scramble up to Chasm Lake although these last 2 are a little interesting. 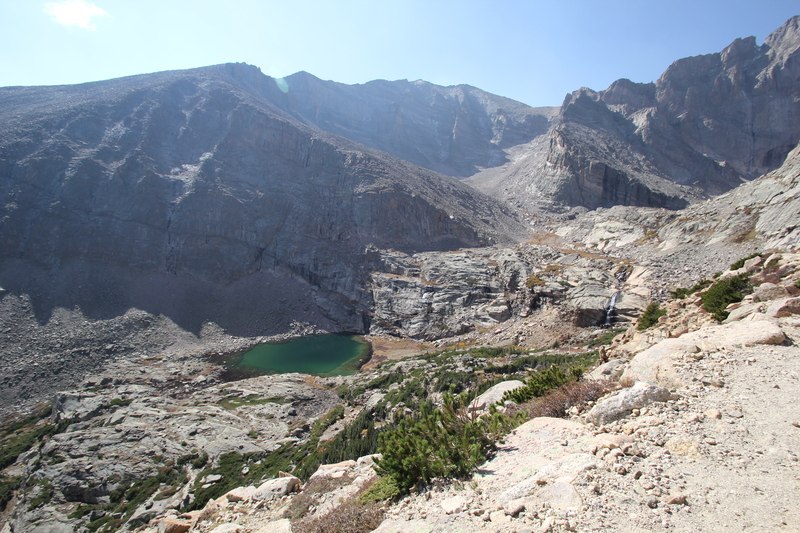 Last week when we reached the summit of Twin Sisters, one of the hikers up there mentioned that if Longs Peak wasn’t in our future we had to at least check out Chasm Lake which is just below diamond of the Peak. 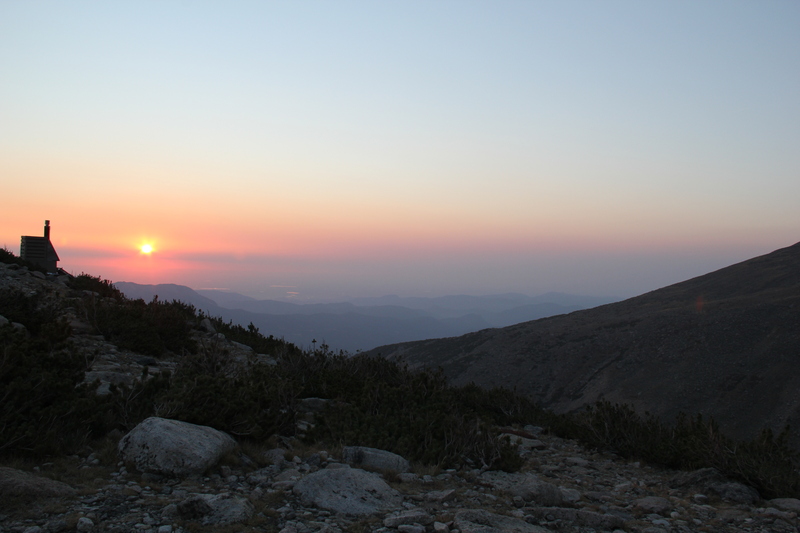 The other challenge we discussed was getting to see a sunrise at one of our summits. 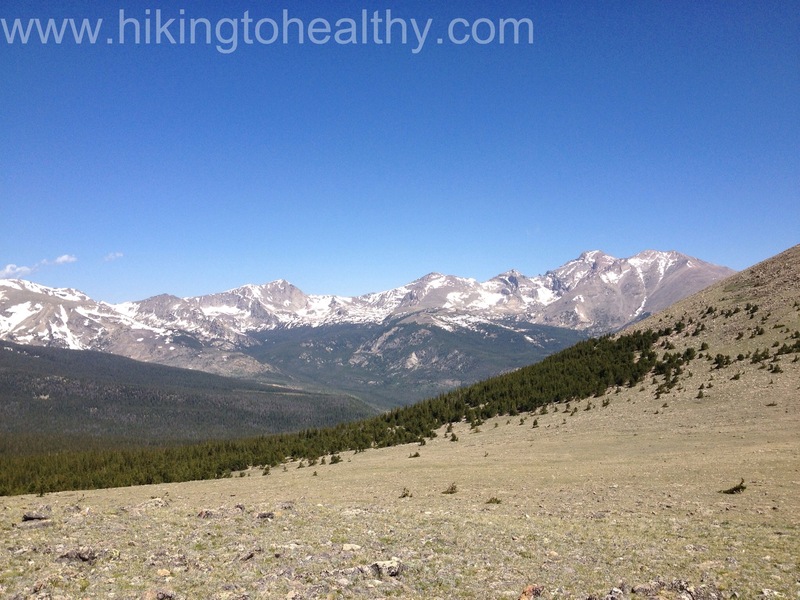 We only have a few more chances to get some higher altitude hikes in before the weather changes and this sounded like the perfect one to try next. 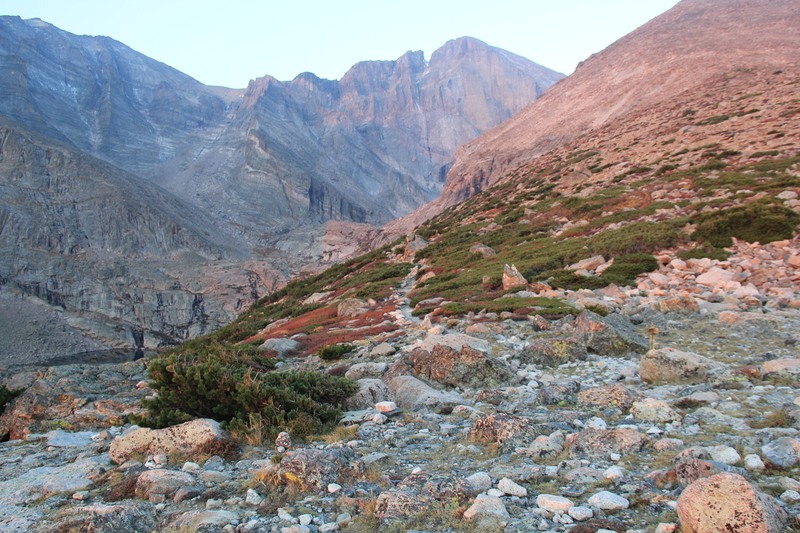 Add to that, the parking challenge at Longs Peak it was also the right one to try to summit by sunrise. So we set our alarm for 2AM and struggled to get any sleep like kids on Christmas Eve. We got to the trailhead at 4:15 AM and in a pretty decent sized parking lot, there were only 5 or 6 spaces left and the cars were steadily coming in. 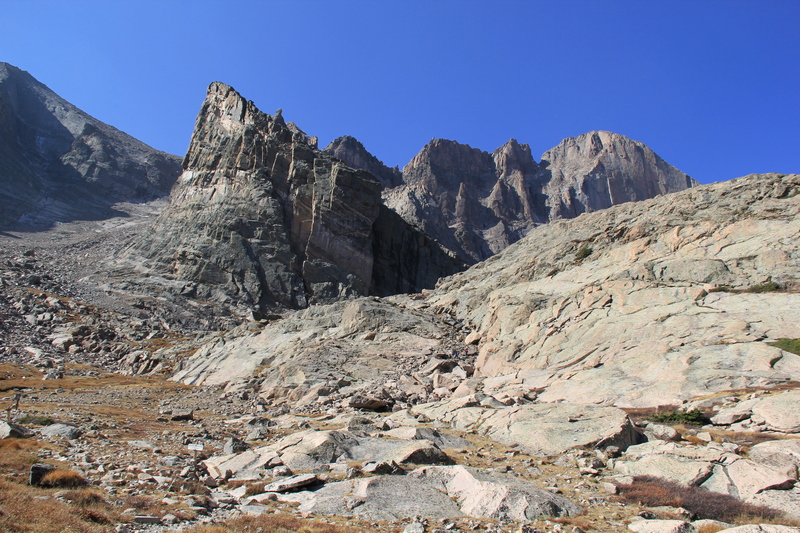 I had read about this parking situation everywhere, Long’s Peak is a highly desirable 14ner to bag and at 7 miles to the peak those trying to meet the challenge get there early. 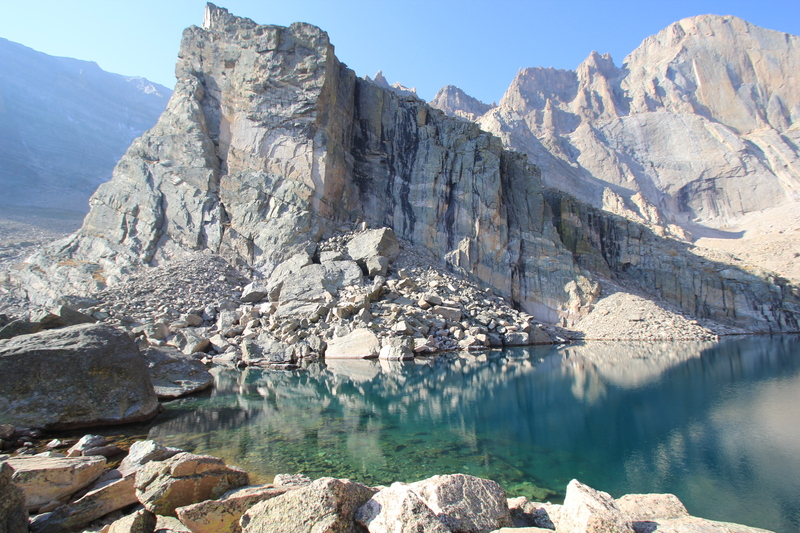 We were the only hikers who just wanted to get to Chasm Lake by sunrise so the pictures of the trails were taken on the way down. Past this sign there is a footbridge to cross over the falls/stream. I am actually really proud of our progress, after just 30 minutes to acclimate to the altitude we started really moving trying to get to our summit as the sun was rising but in the end we were too slow, we reached the next trail junction in a little over 2 hours and the sun had just risen. There is a privy here to the left and by privy, they mean a very short walled box with an outhouse vibe so you are head shoulders in view of everyone coming by ….or waiting their turn… or checking out the view. There is then a simple paddock,signage with 2 trail options, one to the left and one to the right, GO LEFT. We messed up here, twice! 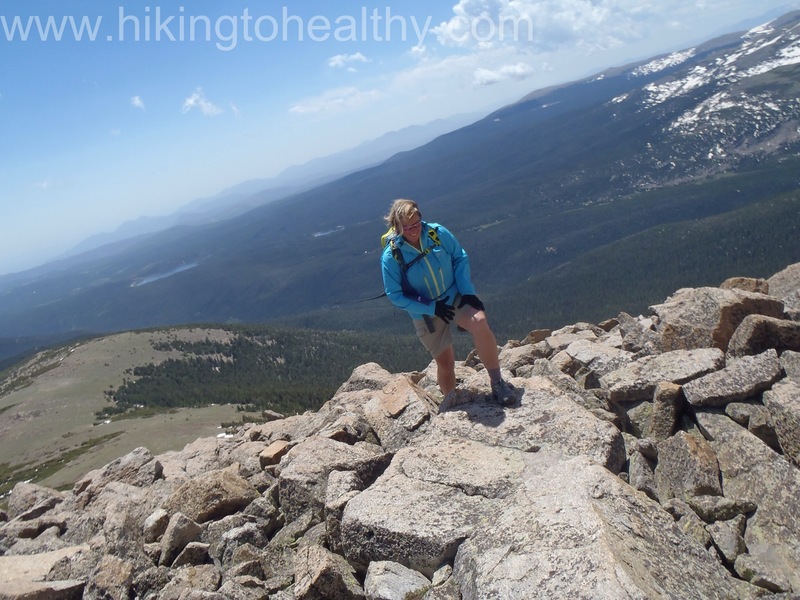 Our maps were simple and misleading we initially started left but looked at the maps and decided it must be wrong so we turned around starting up the Longs peak trail. About 20 minutes up that way I finally pulled my book out and read through it and saw the error of just consulting the map. Back down we went. The trail goes down passing Peacock lake and Columbine falls. The stream feeding those falls continues across our path on a ledge, then up the side of where we had to go to get to Chasm lake. From Denver take 36 through Boulder and then on through Lyons. 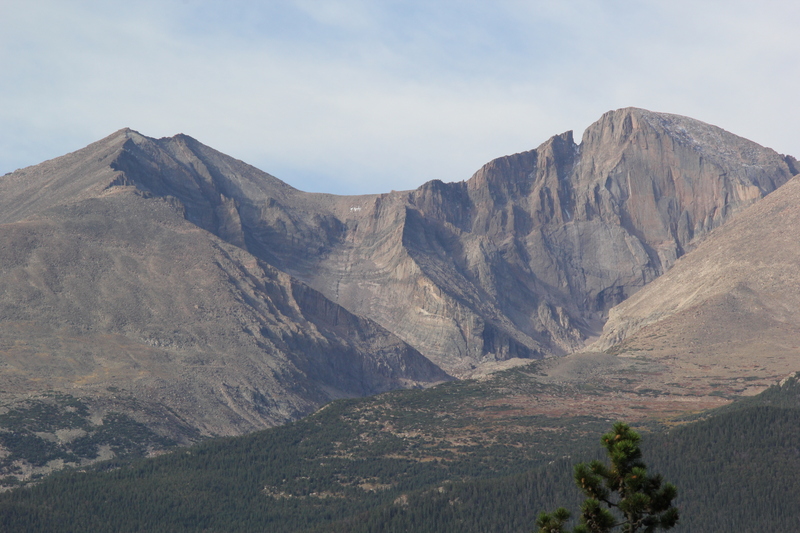 In Lyons you will have highway 7 ( left lane) meet up with 36 (right lane), at the stop sign go left onto 7 and take it for 24.6 miles to the junction of Longs Peak Area and mile marker 9, turn left onto Longs Peak and drive 1.1 miles to the parking lot at the rangers station. 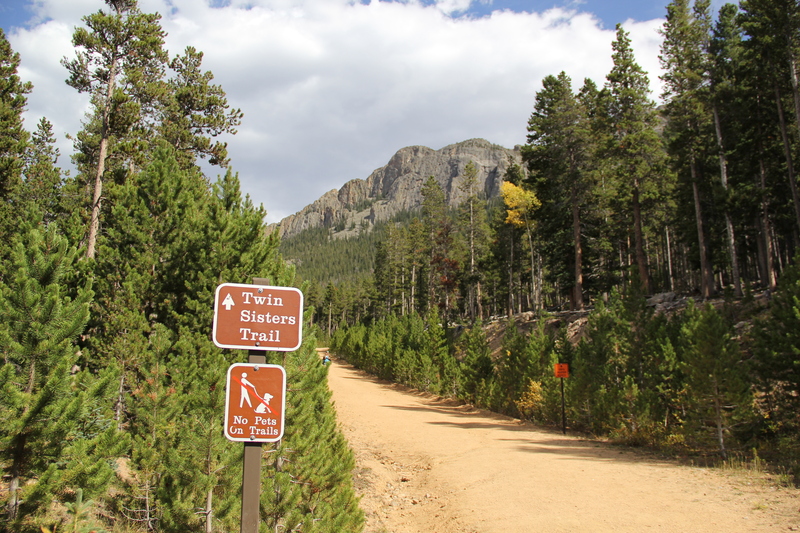 The trailhead is to the South of the Rangers station. Trip Length: 7.2 miles is what I found officially everywhere…My fitbit tracked just over 9 miles but we wandered a lot for pictures. 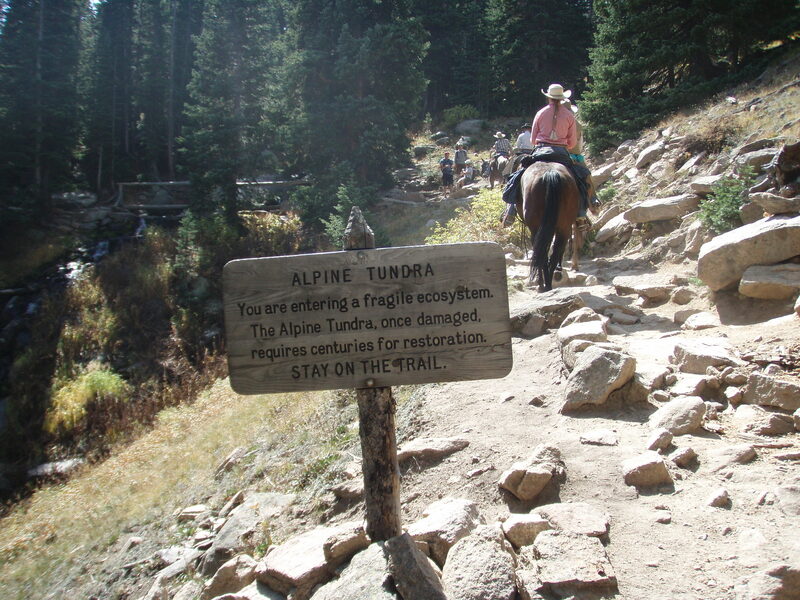 Trail Uses: Hiker only mostly, there is limited Horse access. 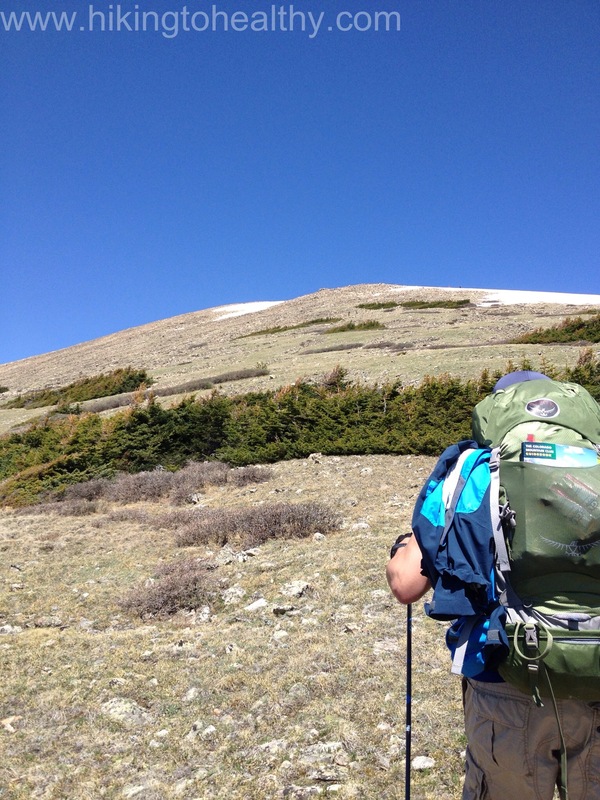 Degree of DIfficulty: Moderate to Strenuous due to elevation gain, high altitude and the steady incline for the entire way up. 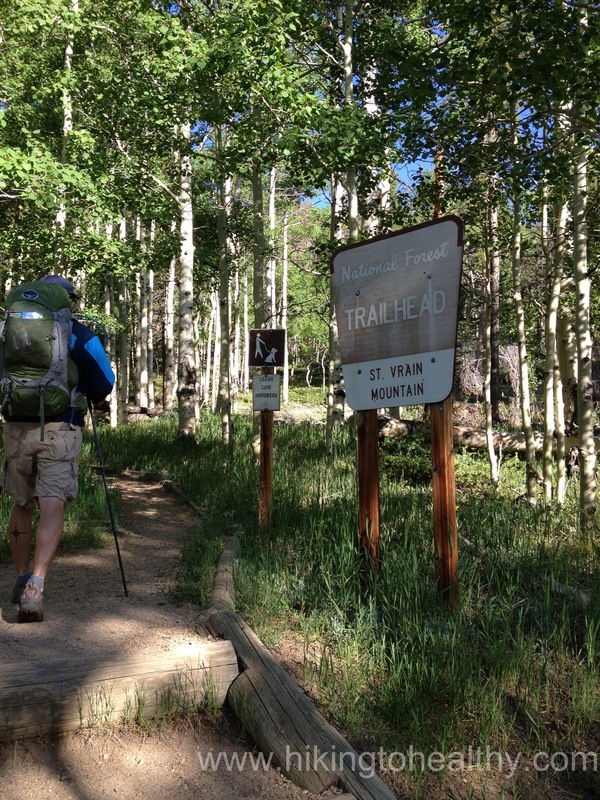 Bathrooms: None on the trail or at trailhead . Lilly Lake has one, although we didn’t find it but due to taking the scenic route to the trail ( we got lost) we didn’t look very hard. 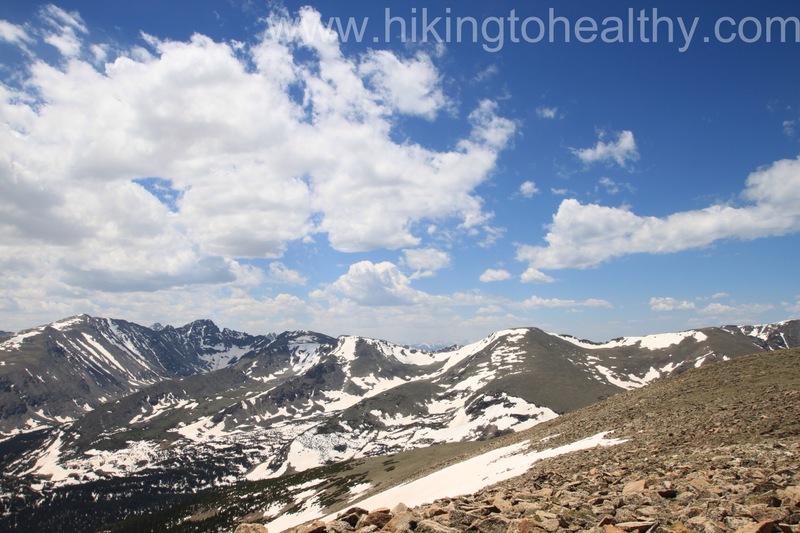 Ok we picked this one solely on the fact that Fall/winter is coming and we have a short window left to keep trying these higher altitude hikes before the weather makes them too dangerous or beyond our skill level. 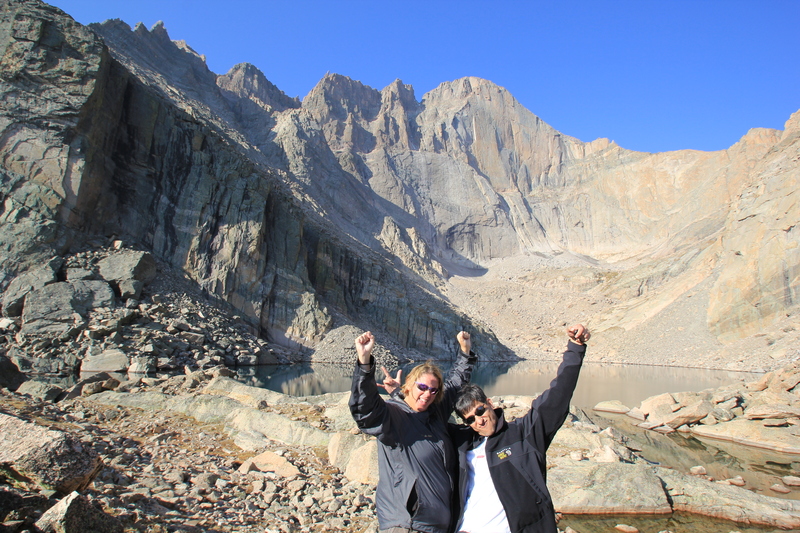 I found it in this book ; A Falcons guide Best Hikes Near Denver & Boulder. It said the hike was a good one for amazing views and it was so right! The views at the top were indeed amazing in all directions! So worth doing if you can! We started at 8:30 and it took us a solid 5 hours round trip, about 2:48 going up and 2 -ish going down. 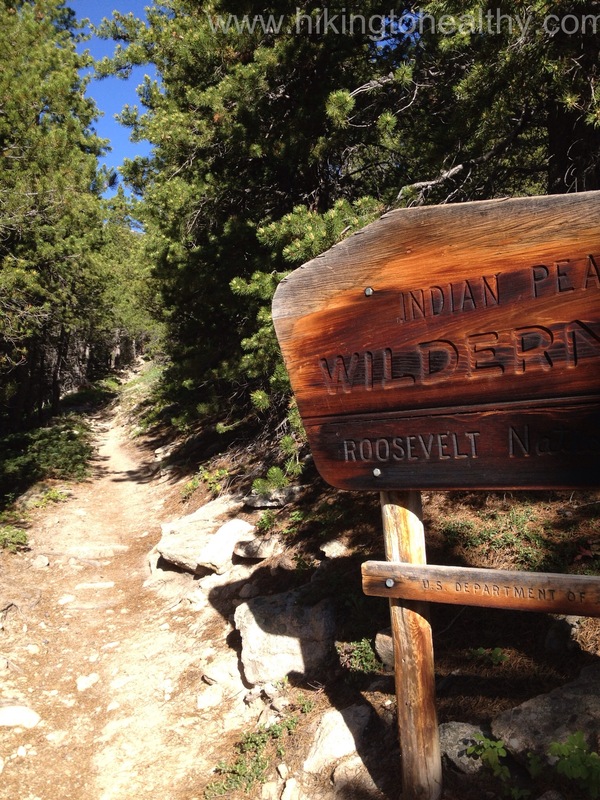 The trail is initially marked very well, but there are no other trails that will cross your path. That means there is then no other signage but the path is obvious. 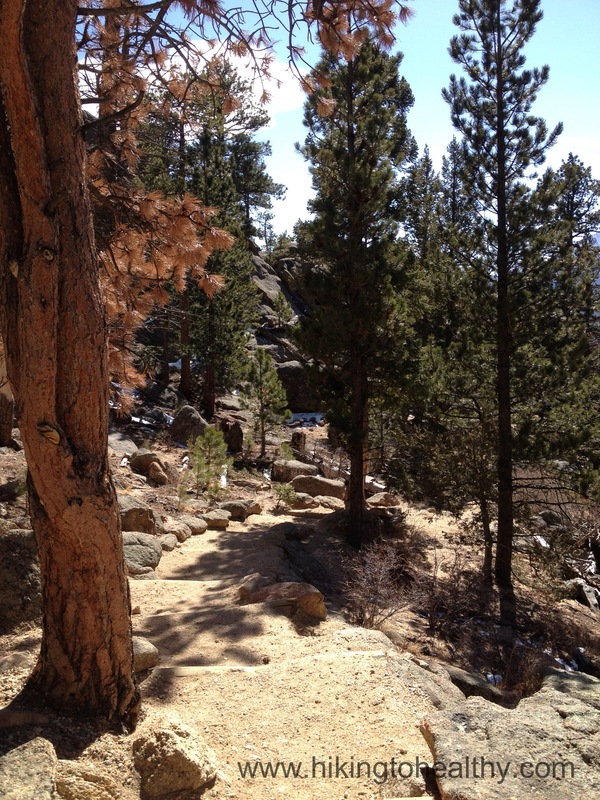 It is a nice sized path, big enough that you could easily pass other hikers if necessary. 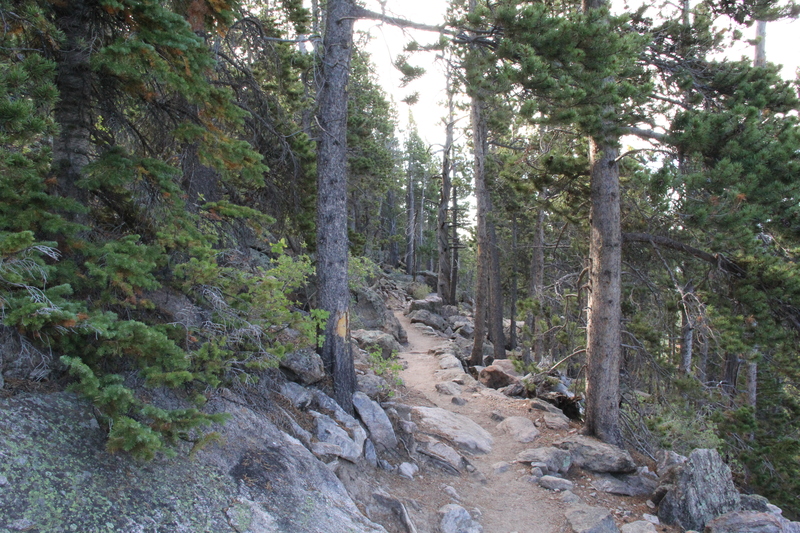 It is a rocky path with a steady incline almost the whole length of the trail one way to the summit(s). We pushed ourselves a little harder at the beginning in hopes of getting to the summit faster than the past 2 weeks of high altitude hikes. But with a gain of 2200 feet over the course of 3.5 miles, the incline kept us pretty slow going. 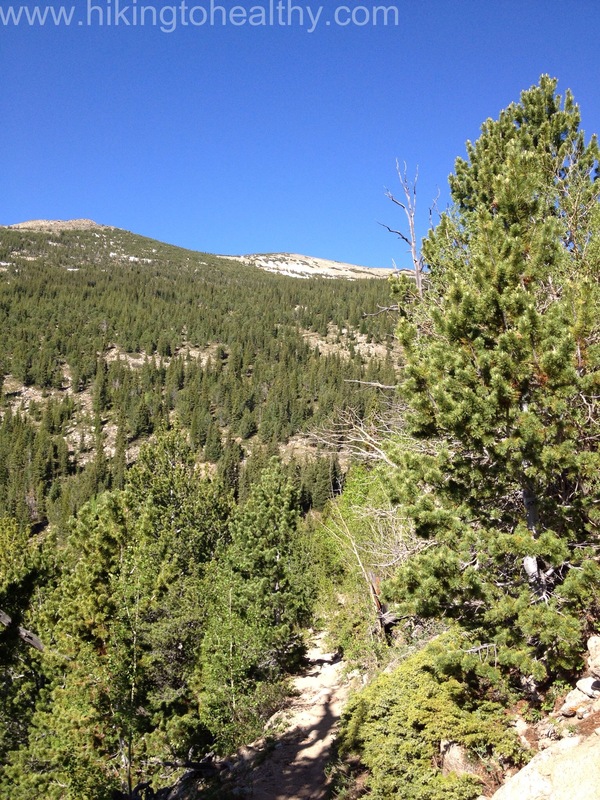 The next mile and half is a lot of the same, lodge pole pine and peeks of the mountains…lots of heavy breathing and the body check by those hikers passing by. 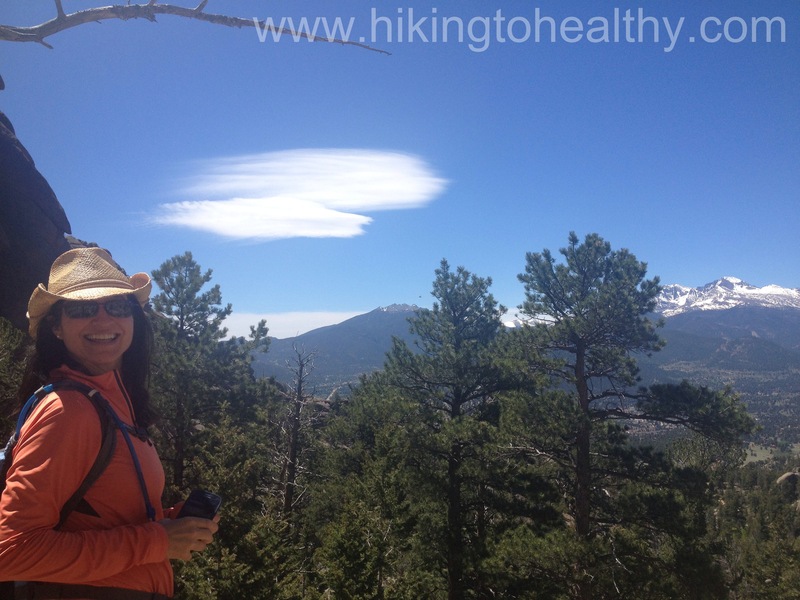 For the 3rd week in a row I was chubbiest hiker on the mountain, oh well I am doing it! 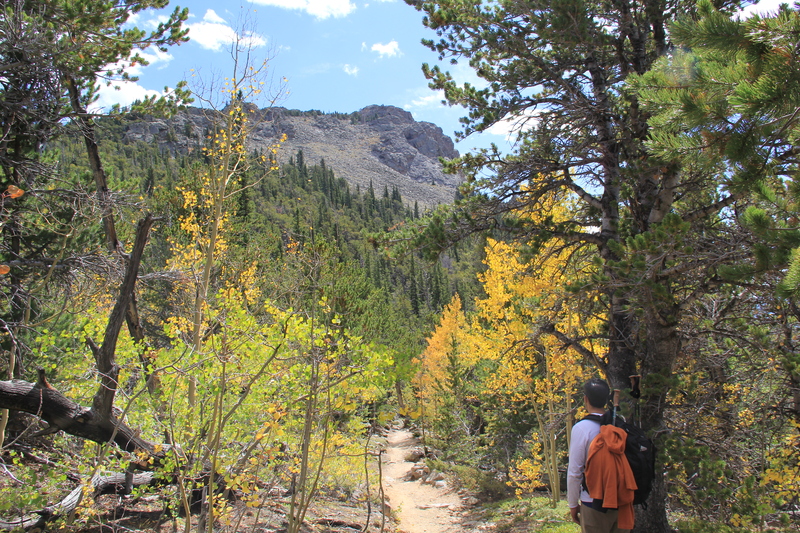 As we got closer to the top, there were more and more Aspens showing up and they were in full fall beauty all golds and stunning. 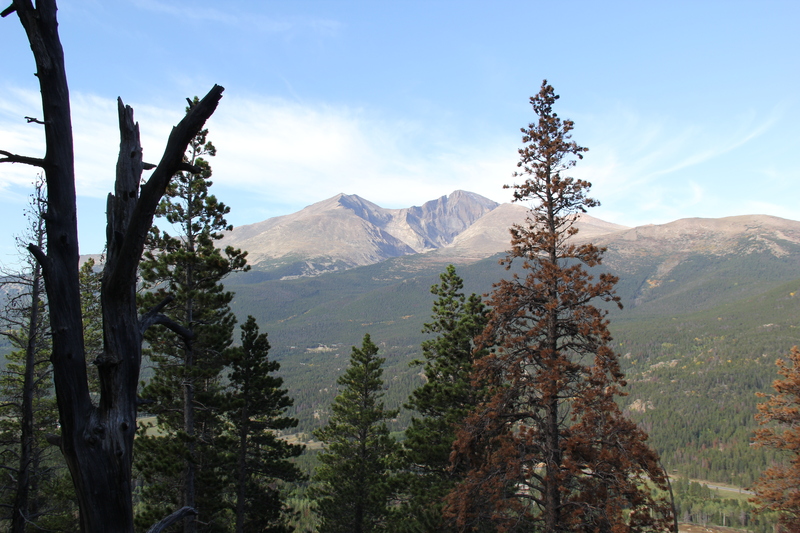 From this point, the trees started to thin and we moved from Rocky Mountain National Park to Roosevelt National Forest. 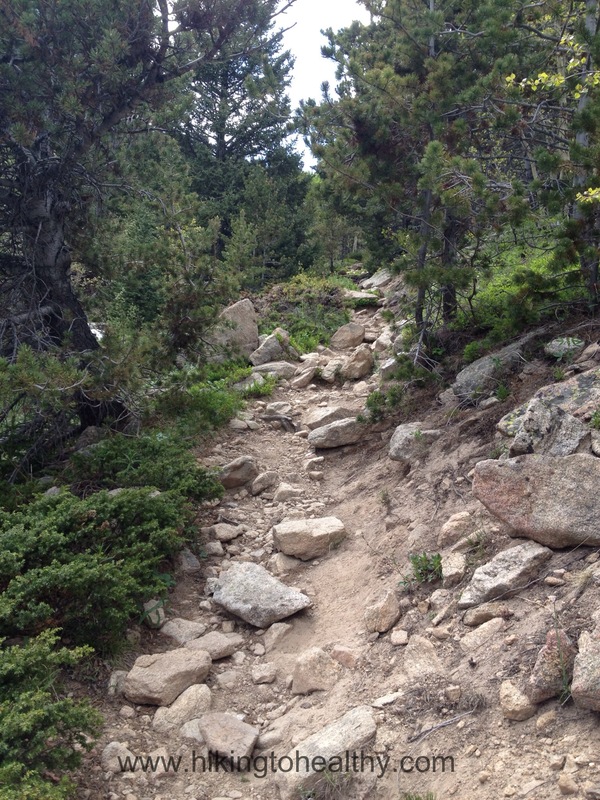 There is a small break from all the switchbacks here and a little leveling off, but it doesn’t last long. All too soon you are back to the “twisted” part of twin sisters and switch-backing it again. 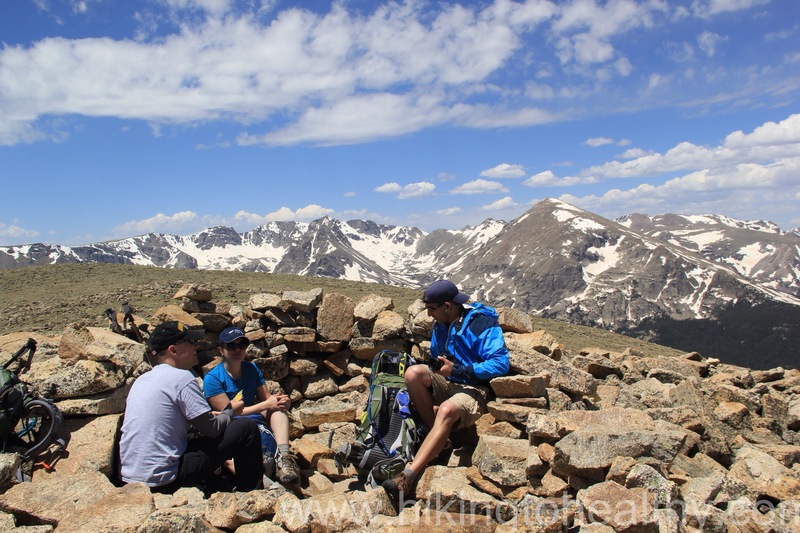 When you finally break through to the last bit of climb to the saddle, it is hard to keep your footing….not because of the path, but because the views are non stop amazing. I know I would have moved faster if I had blinders on, but really this is why I am doing the hike in the first place. It was simply stunning the whole way up. 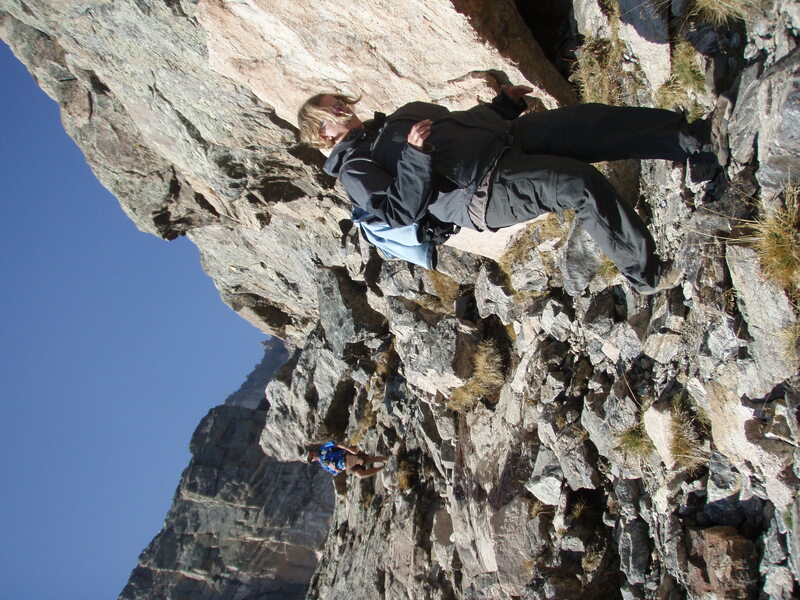 When we came on the final ascent, it looked like a scramble but it wasn’t that hard really. 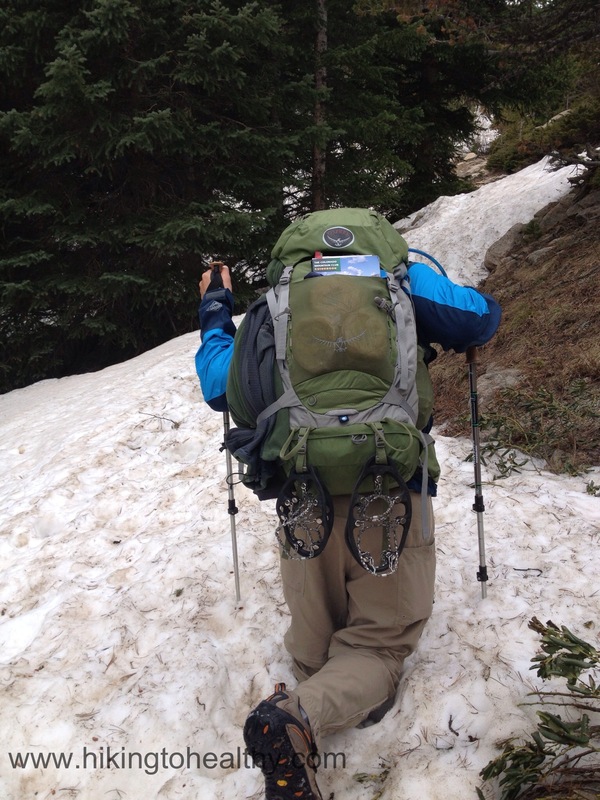 The path is easy to follow and not very difficult, we actually just held our poles up to save time. I proud to say my extra conditioning this week helped with the pole thing, they were not nearly as difficult to deal with this morning as they were last Saturday! Plus you fly through the final ascent, we saw groups ahead and behind the whole way and they speed in which we met each other was surprising. Everyone was so happy too and I get it now, it is satisfaction of making it up to the top to really see it all. 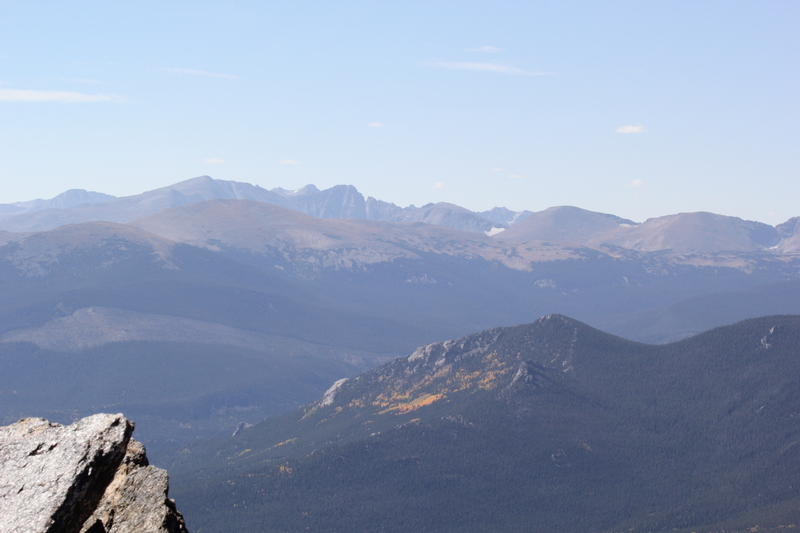 At the saddle you have a couple of choices, you can do both peaks easily if you want. The East one on your left is the higher of the 2 by just a few feet. The west one has a very easy path up and passed the Building/solar panels on your right. 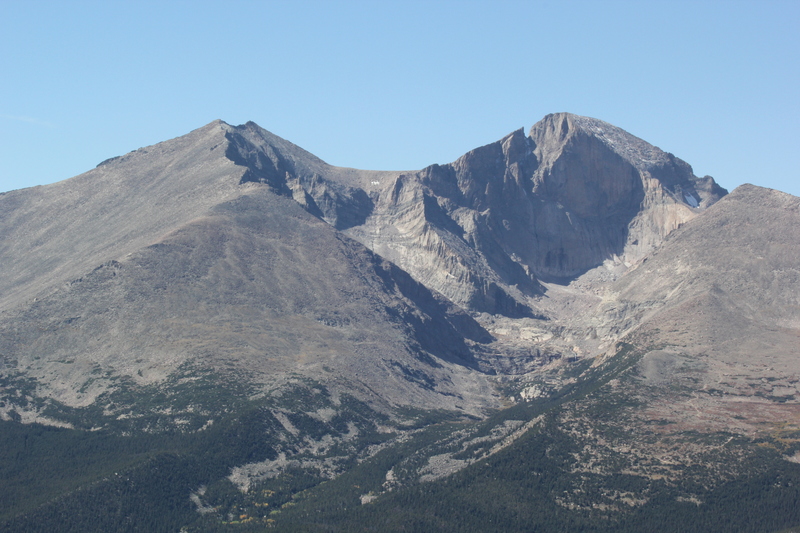 Straight head is a 3rd peak, I have read a couple of things about this peak….it is unidentified mostly but one webpage said it was the actual peak named Twin Sisters and to get to it requires serious climbing gear and skills. 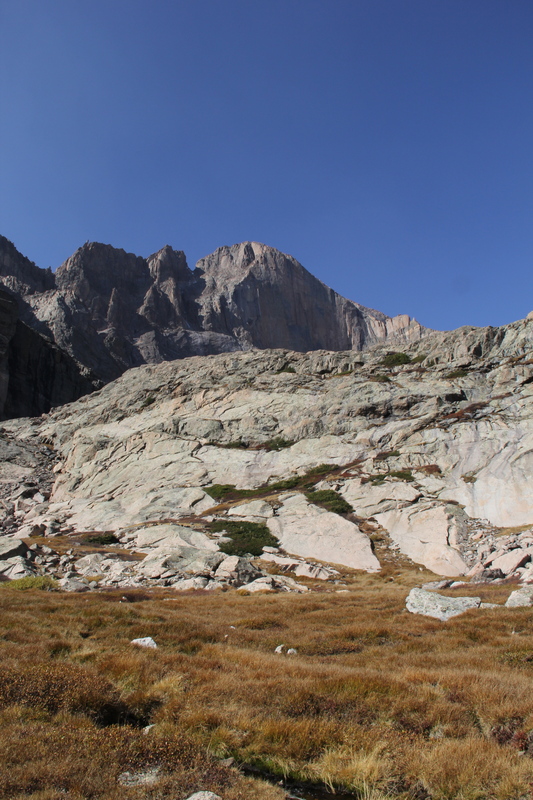 The east peak has no defined path and is only a few feet higher than the west peak… but will take some solid bouldering skills so we picked the west peak. Around the building and up is a slight scramble, so easy compared to Upper Mohawk Lake. 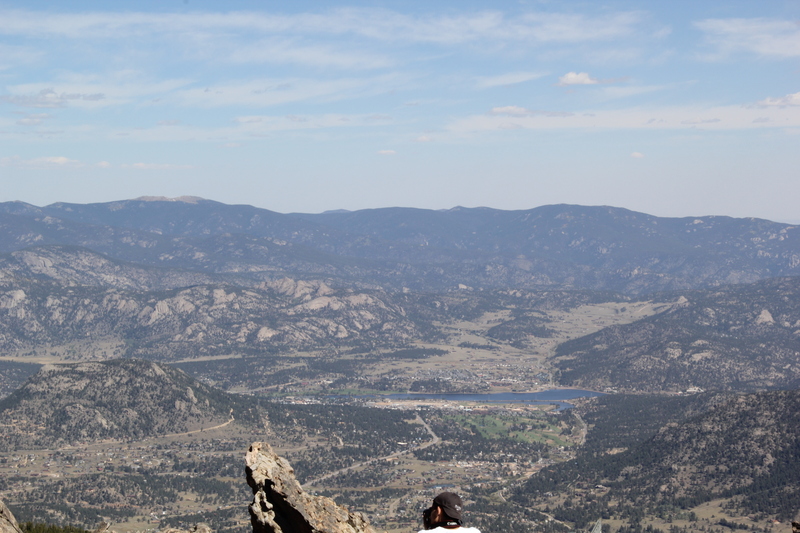 At the top it really astounding and I feel like I say it all the time, but this is another reason I love Colorado. 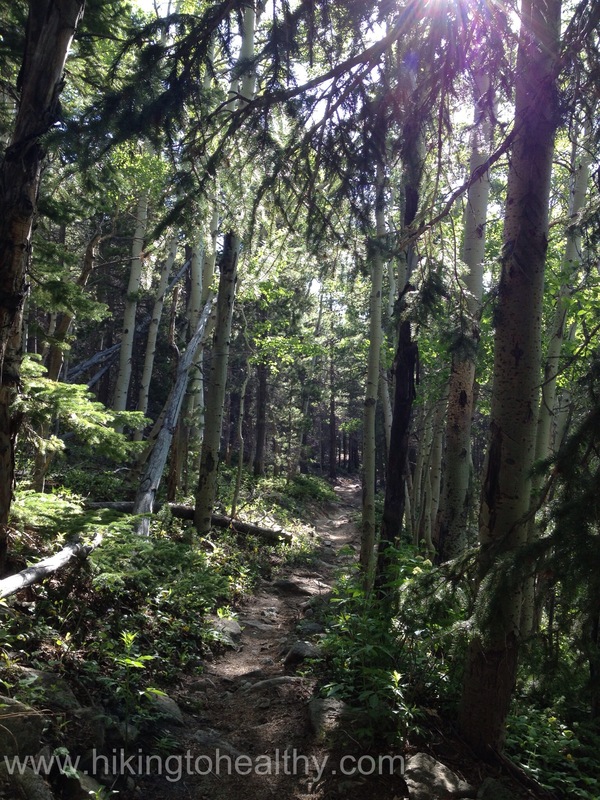 All the trails we have done are stunning, I am starting to think this is heaven on earth! I keep waiting for a bad one, but this wasn’t it. The weather is really tricky here, we picked a perfect day today and had great weather, but it is always windy at the top of Twin Sisters. With all high peaks, there is a threat of a storm moving in after noon so go early. Check the weather and be prepared! 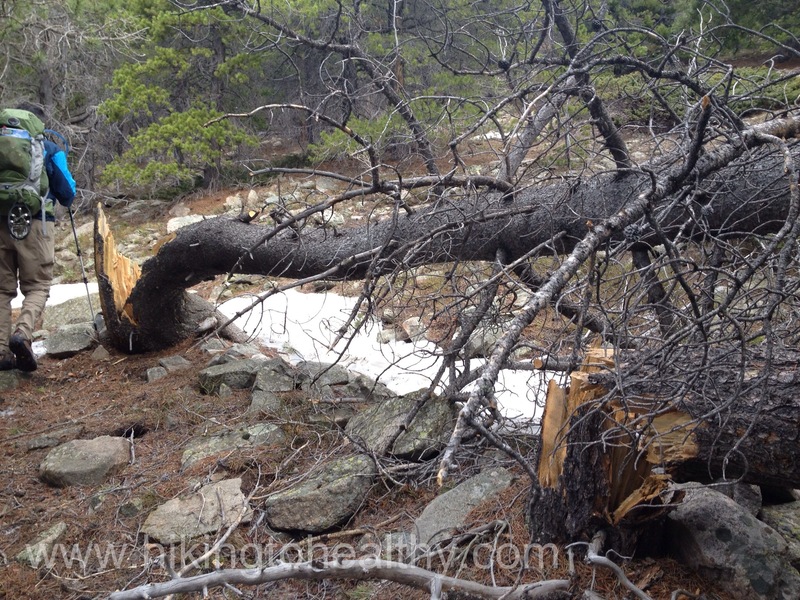 On this particular peak if a storm moves in lightning is your greatest threat so be smart. The mountain will always be there, turnaround if the weather changes and don’t take chances. It is a straight in and out trail, we turned around and went back down after lots of pictures, I will put the directions after some amazing shots! Directions: From Denver take 36 through Boulder and then on through Lyons. 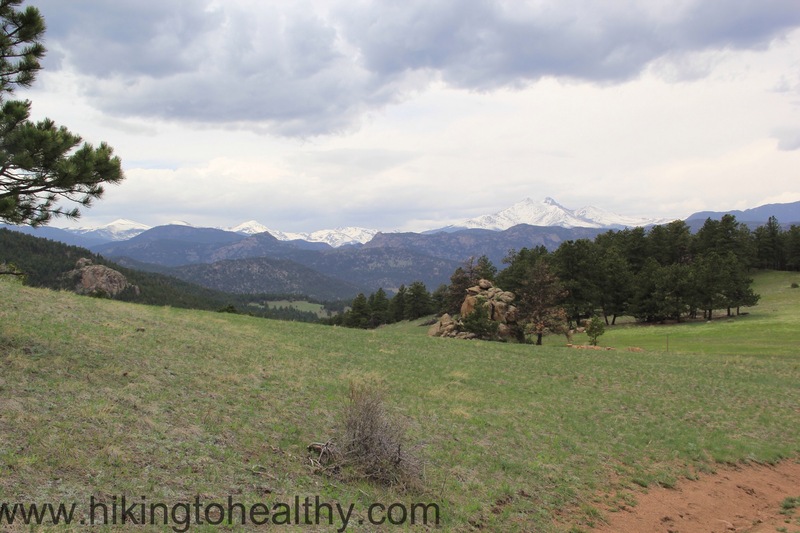 In Lyons you will have highway 7 ( left lane) meet up with 36 (right lane), stay right on 36 to Estes Park for about 21 miles. 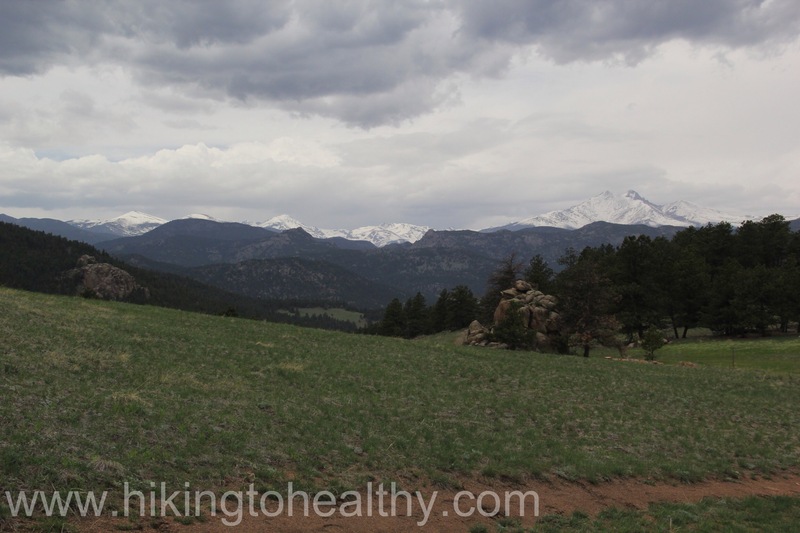 Take Colorado Highway 7 south from Estes Park about 6 miles to Lily Lake Visitors Center, on the east side of the highway. 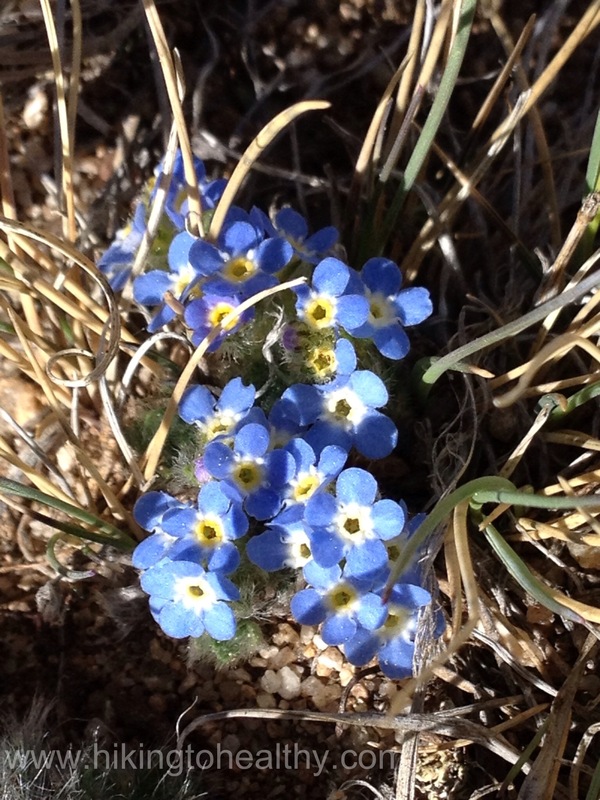 Follow a short gravel road to the left of the visitor center 1/4 mile to the trailhead. Parking is limited, additional parking is available at the visitor center.